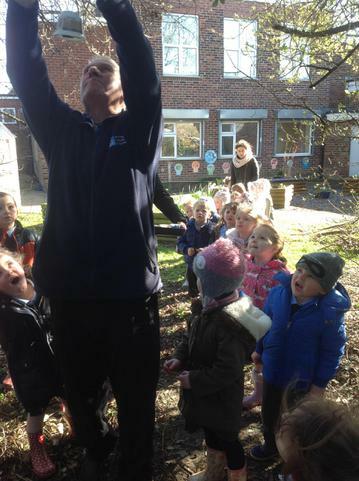 This week we have been watching the bird cam in our ICT suit as there birds living in the nest box! 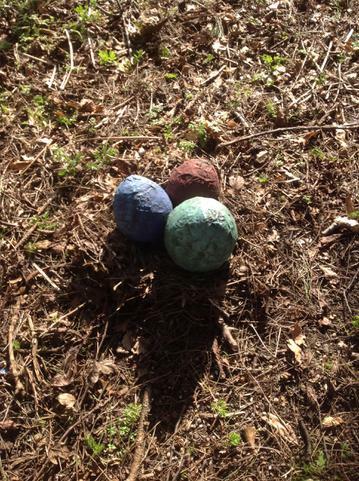 They have laid some eggs! 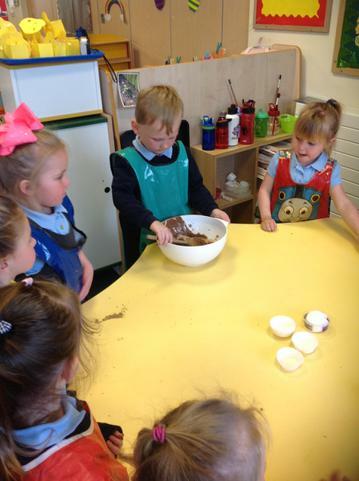 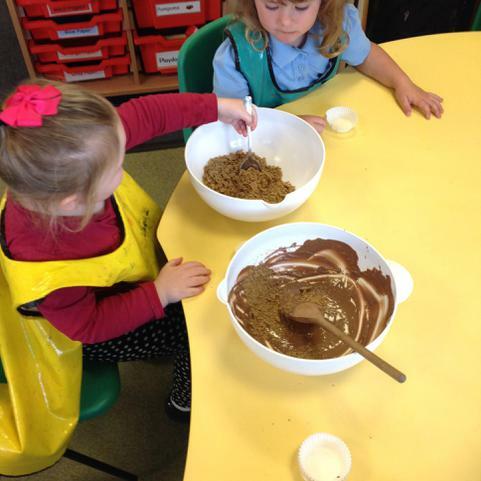 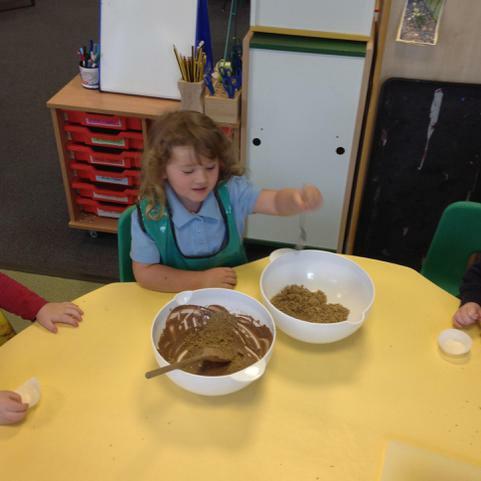 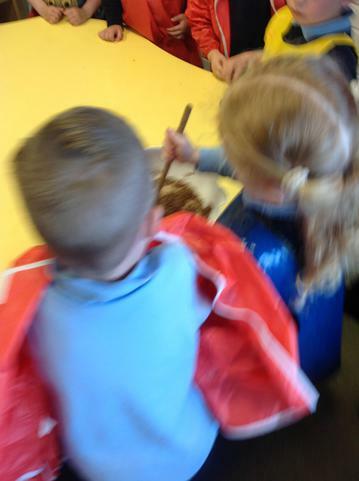 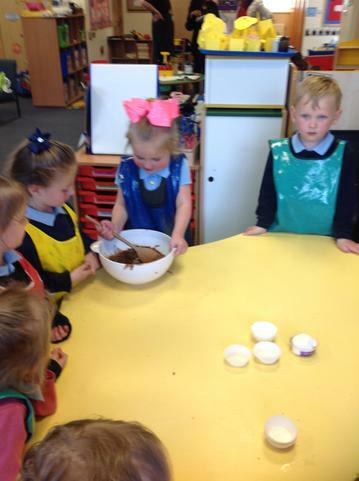 We have been making chocolate nests and Easter cards. 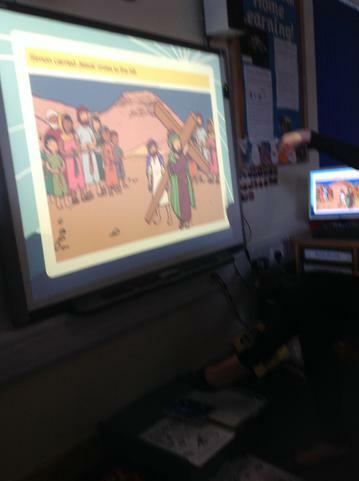 We have really enjoyed this term and our topic work. 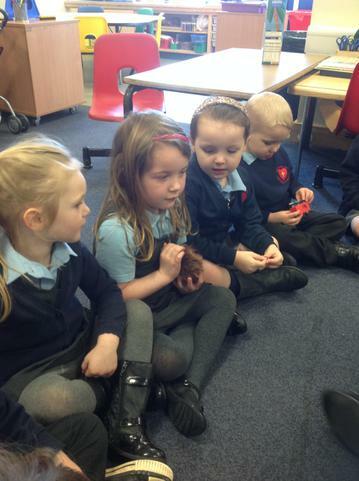 We have learnt about lots of new things and had lots of fantastic learning experiences. 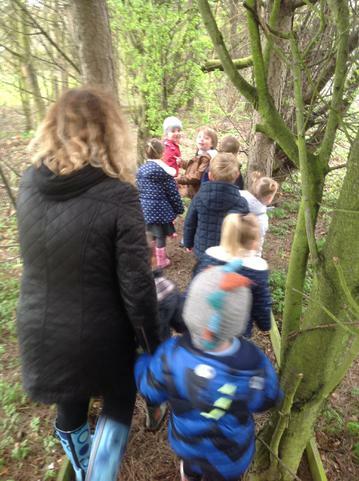 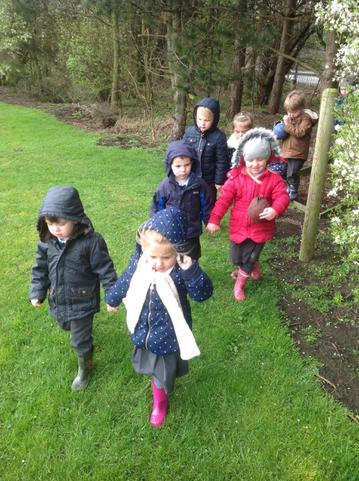 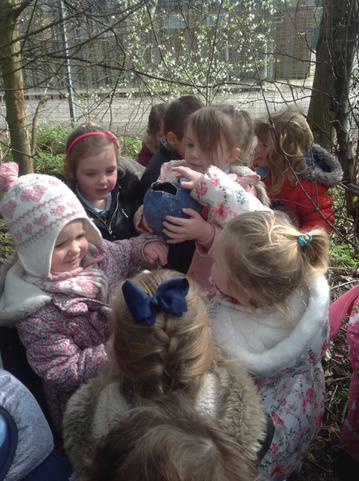 We hope all our Nursery children have a fabulous Easter Holiday and we will see you next term! 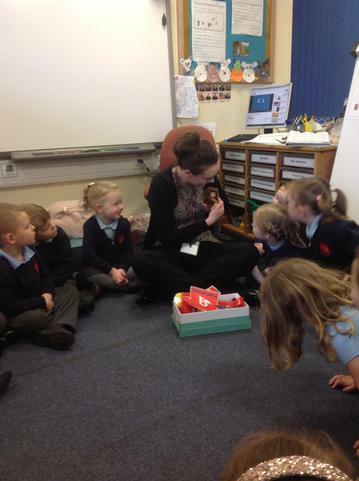 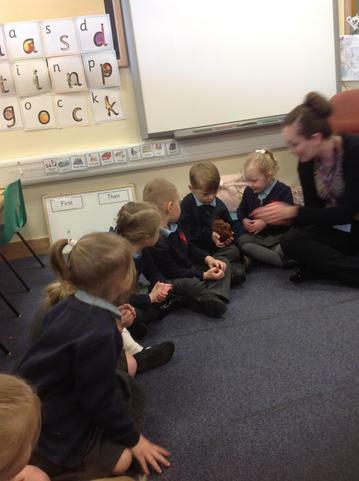 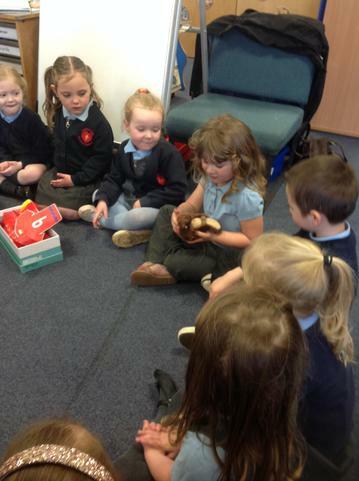 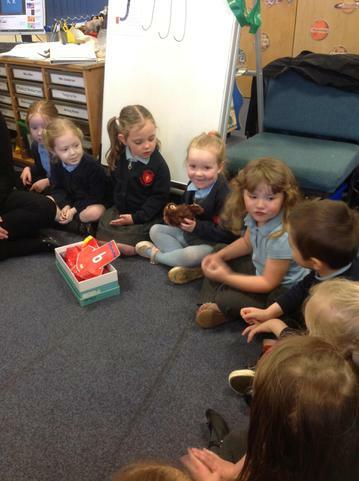 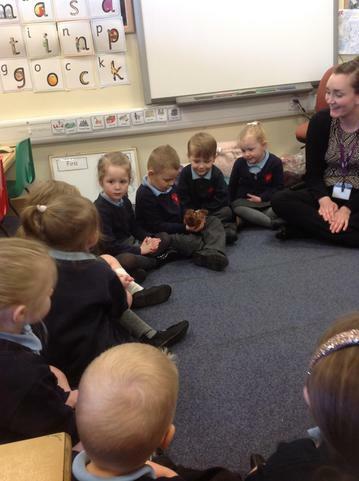 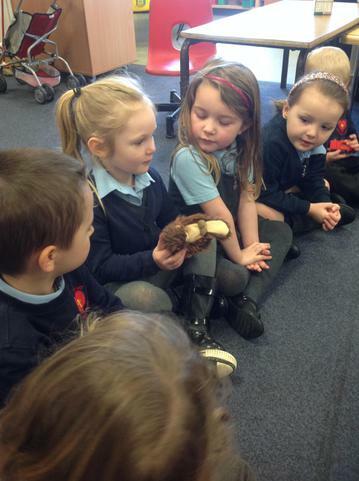 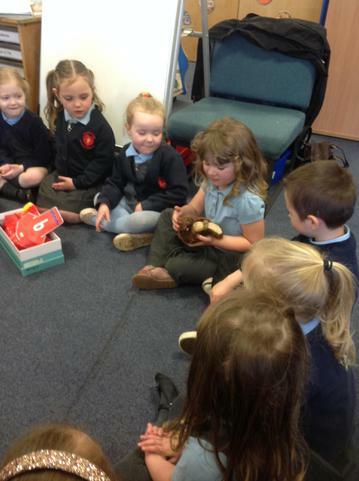 Folling on from our animal visit, Miss Olive brought Bertie the Beat Baby to school to visit the children. 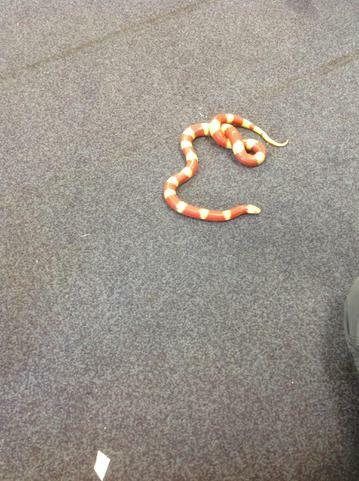 However, he escaped! 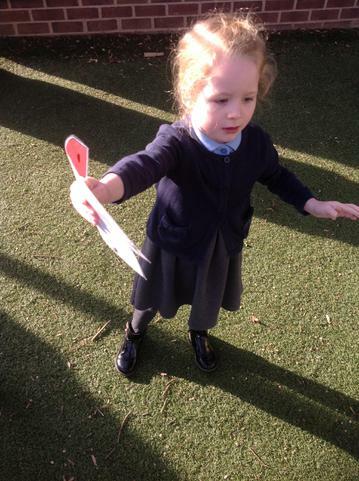 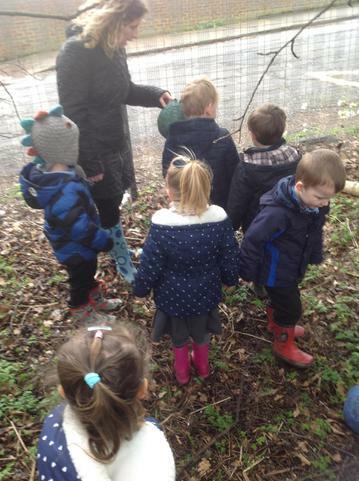 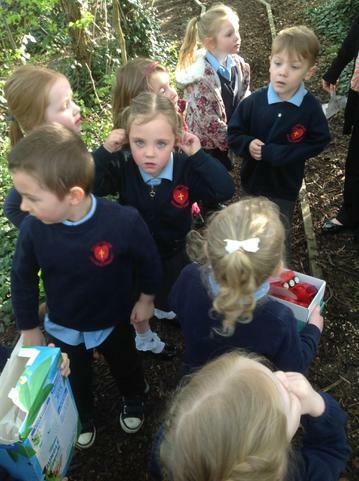 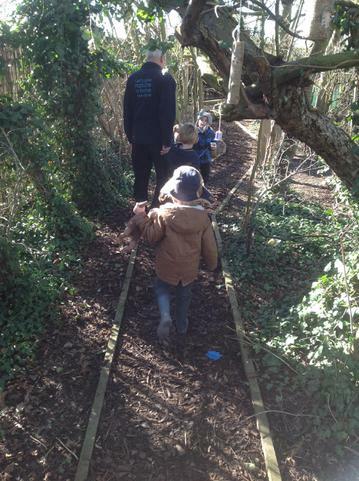 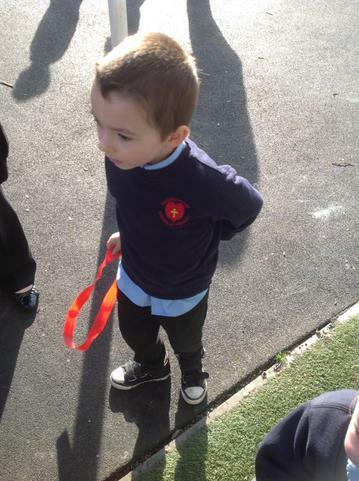 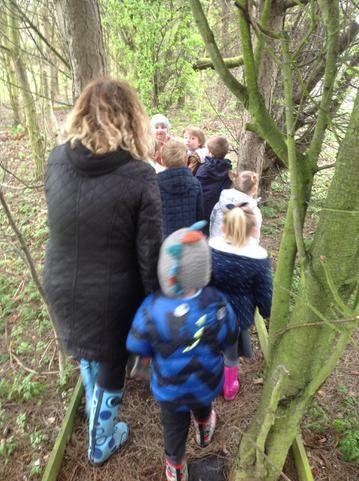 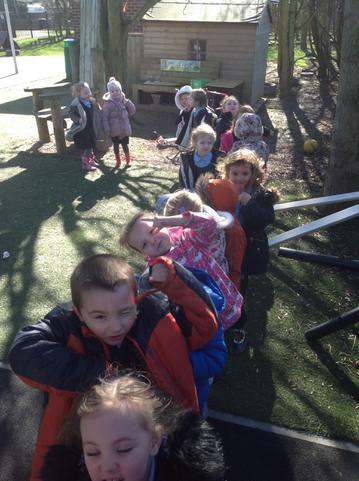 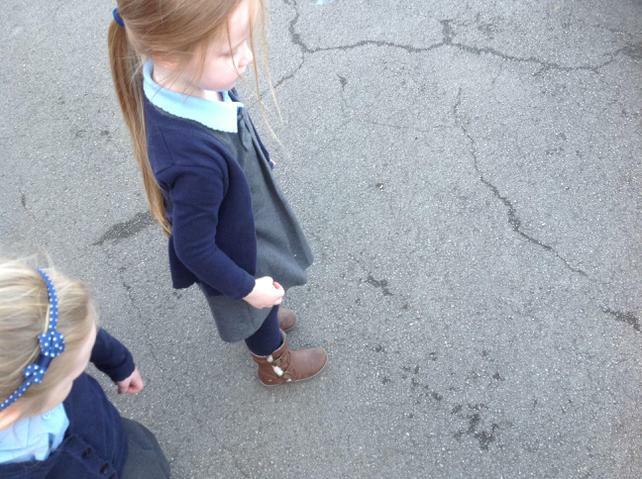 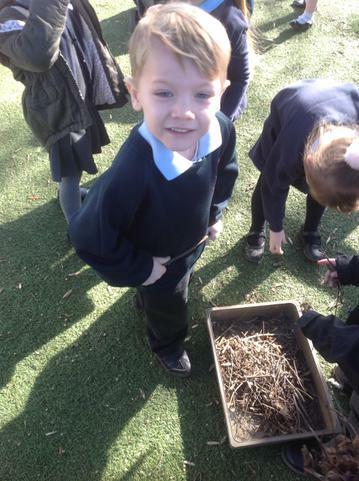 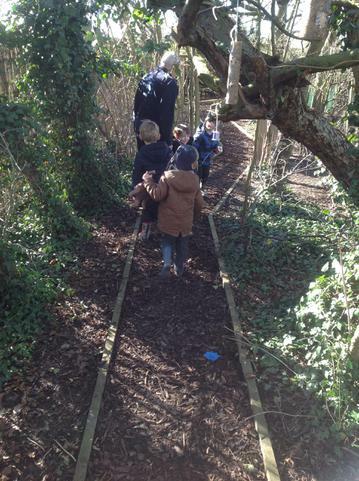 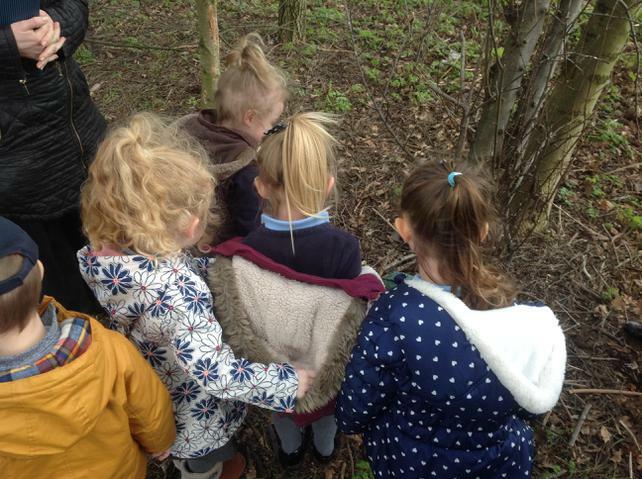 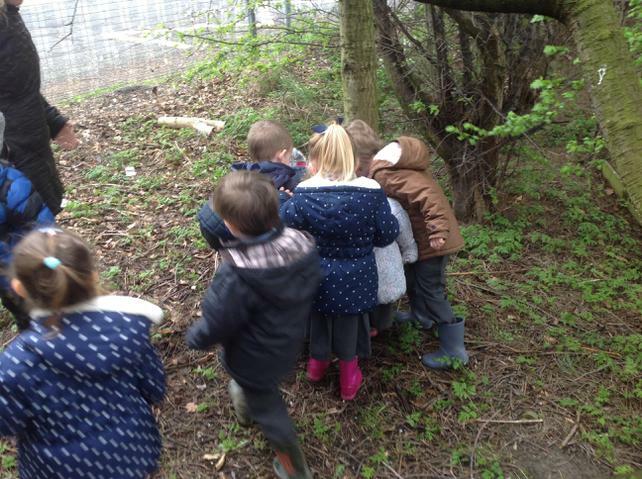 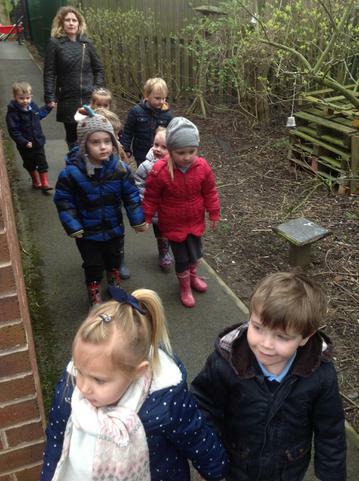 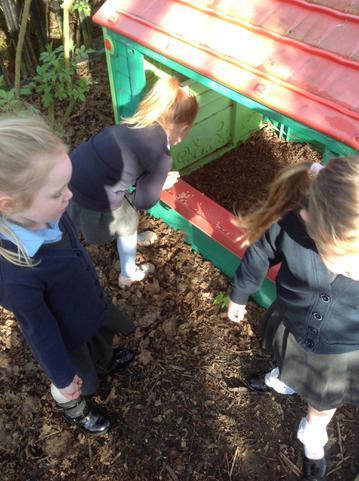 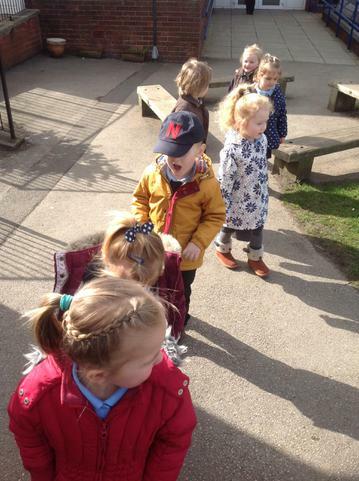 Our Nursery children had to search outside to find him. 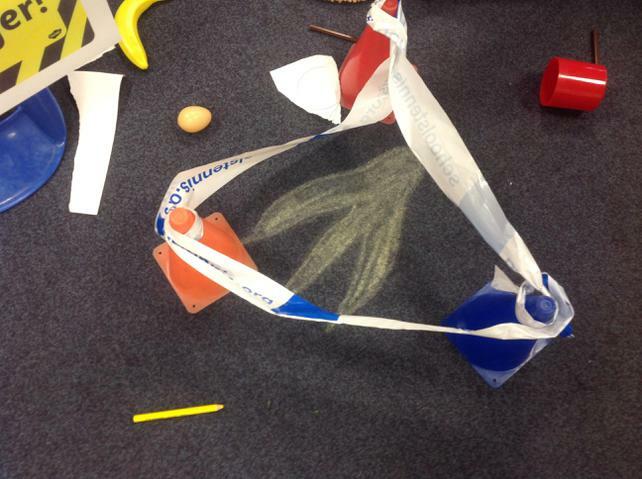 He left clues such as his favourite toys. 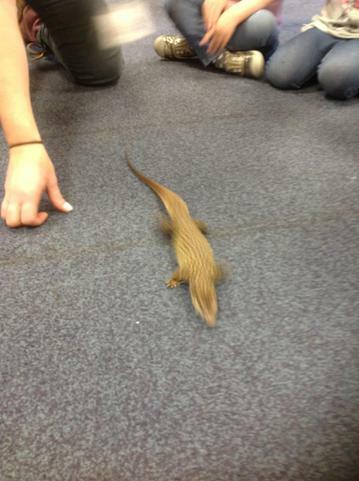 He was very hard to find though because he is brown. 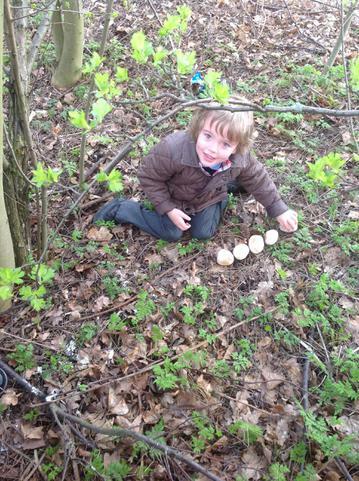 This means he is camouflaged amongst the trees! 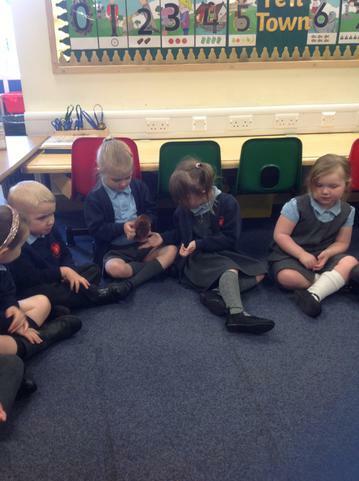 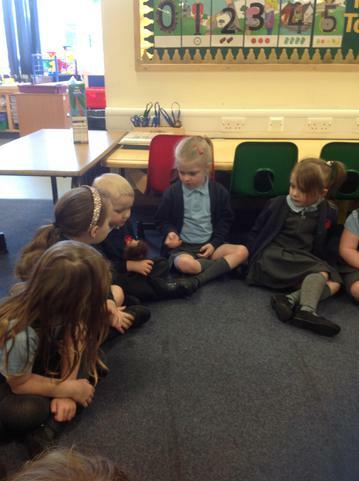 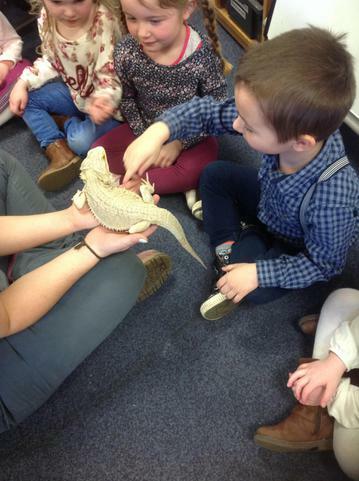 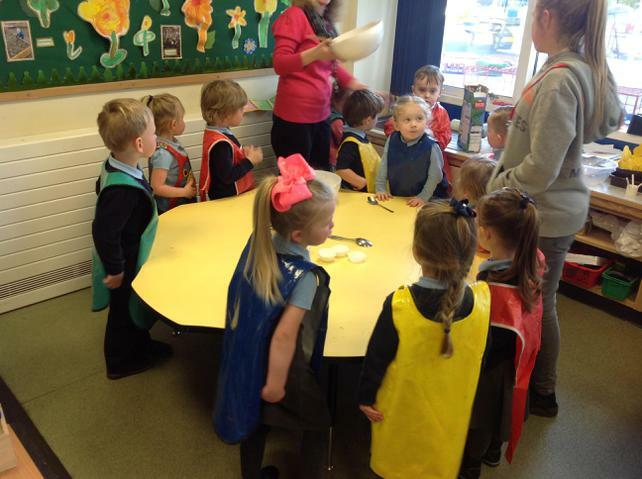 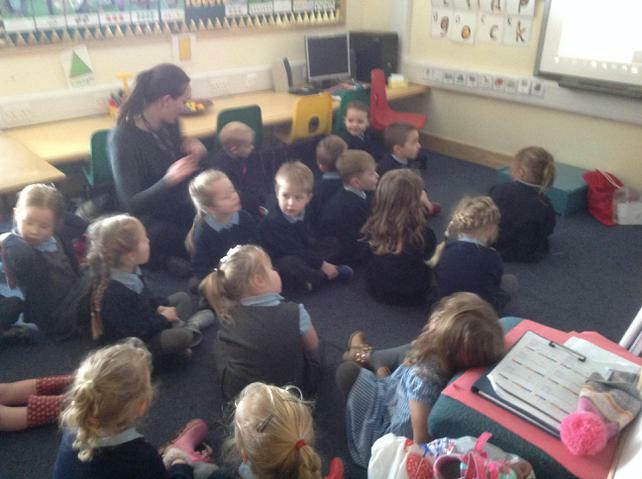 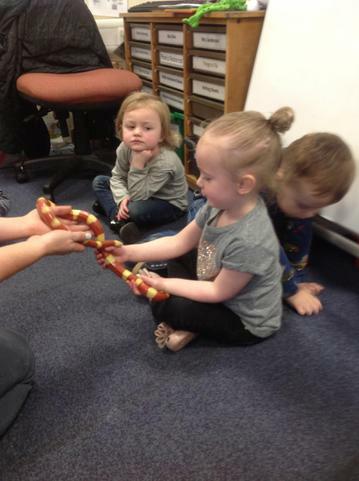 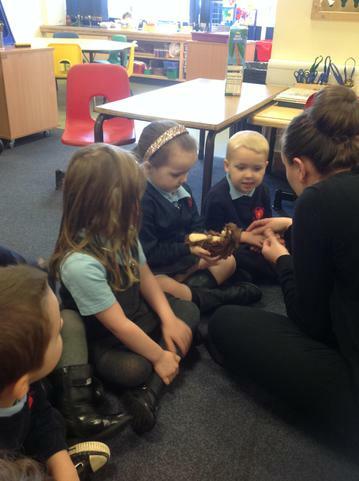 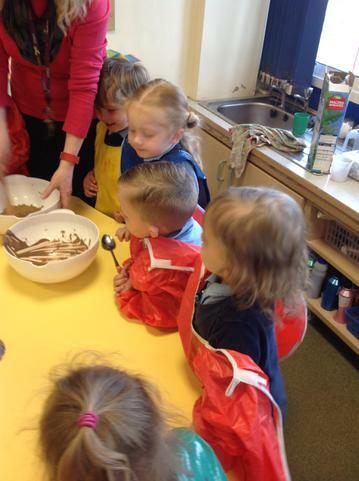 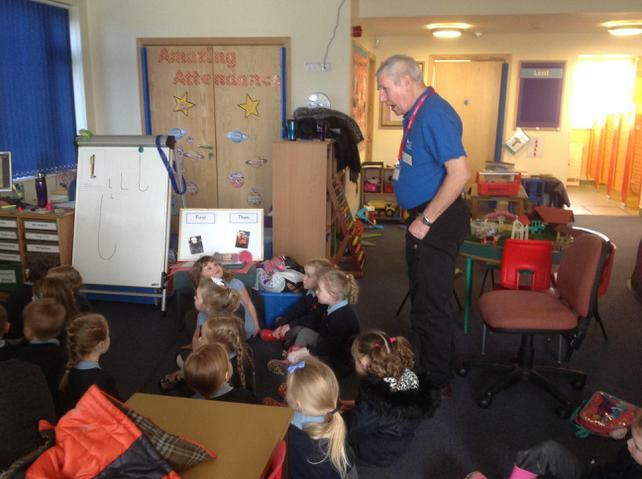 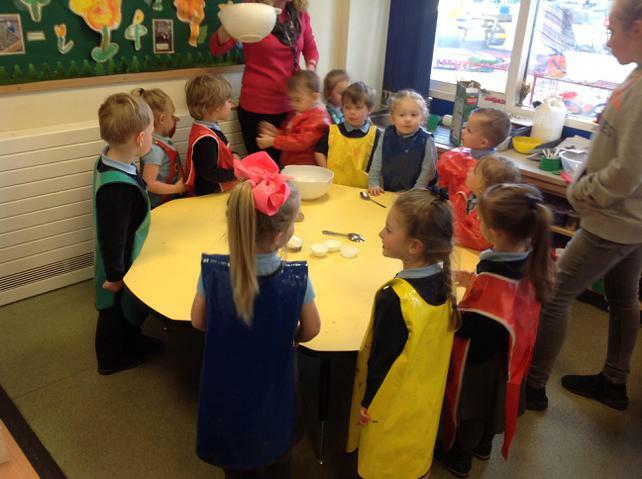 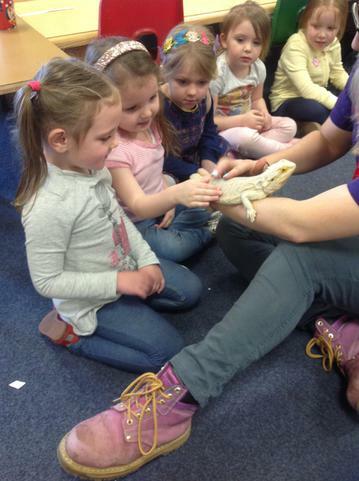 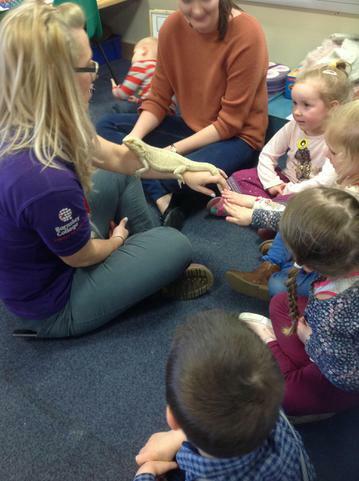 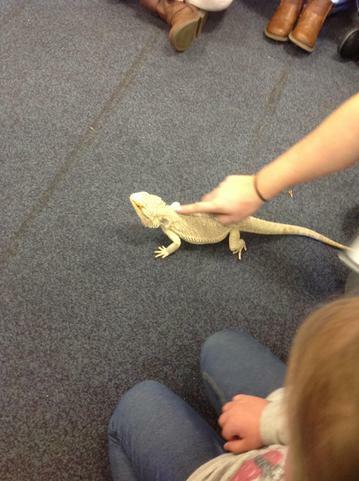 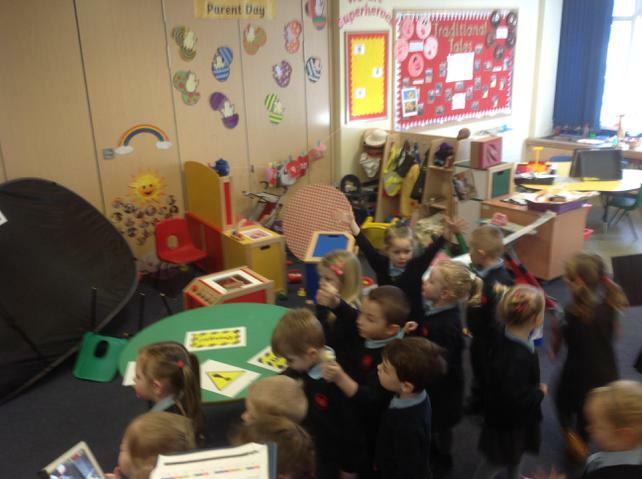 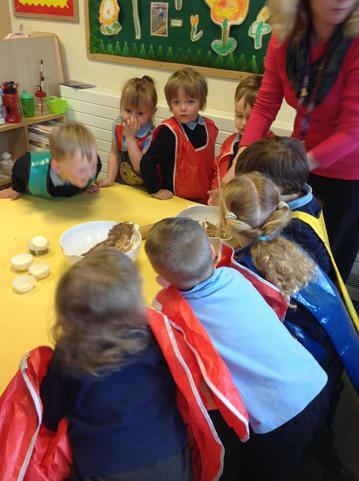 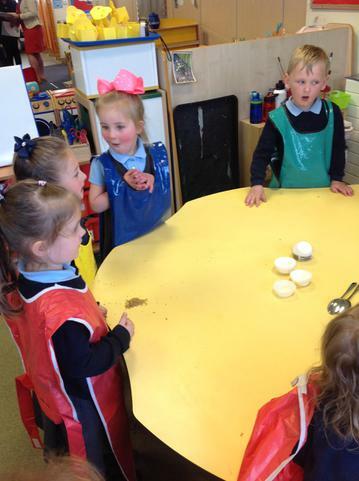 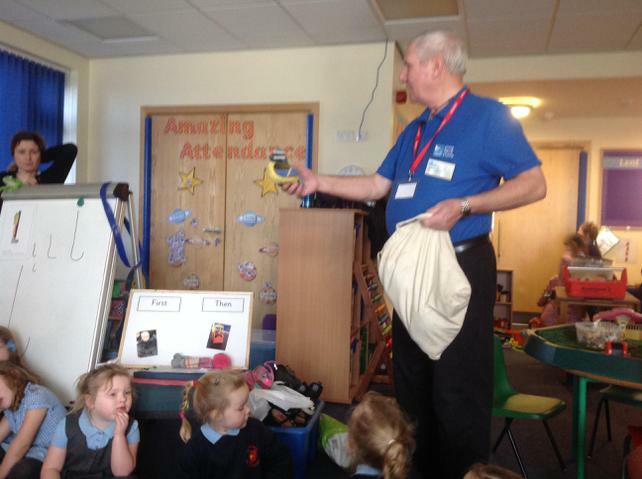 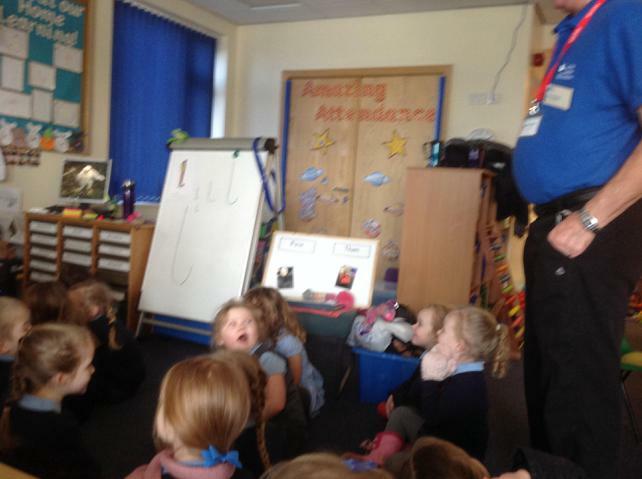 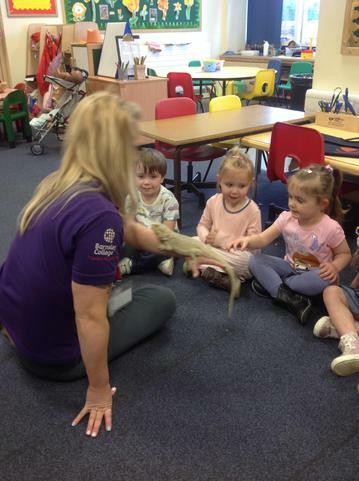 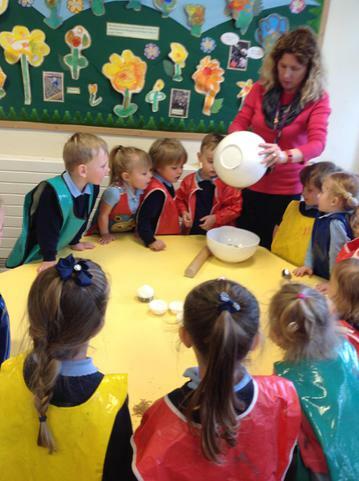 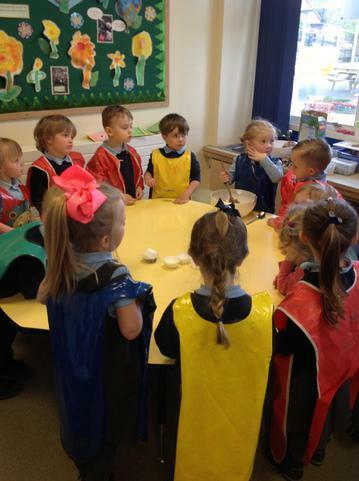 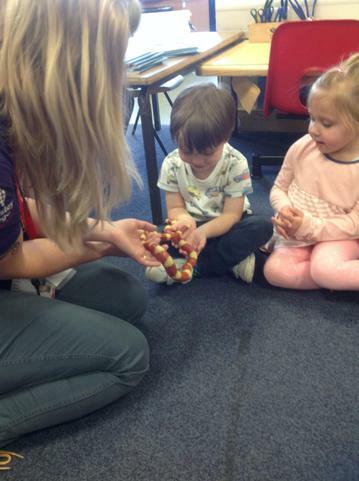 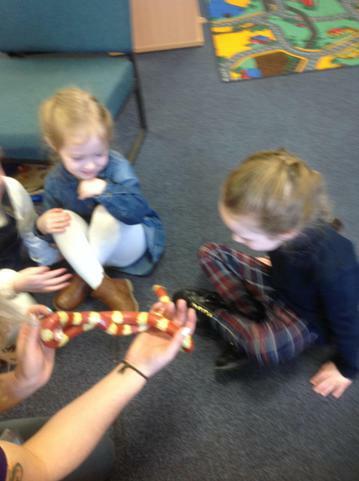 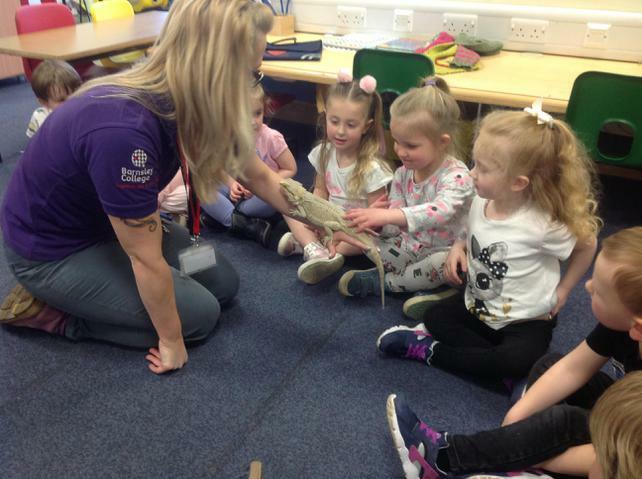 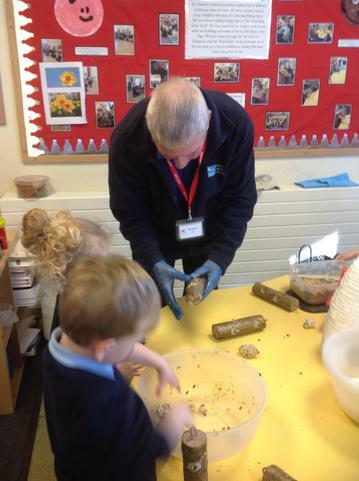 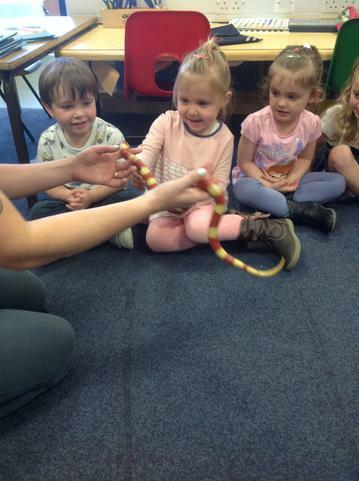 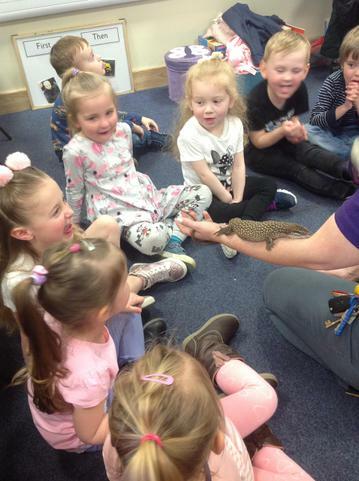 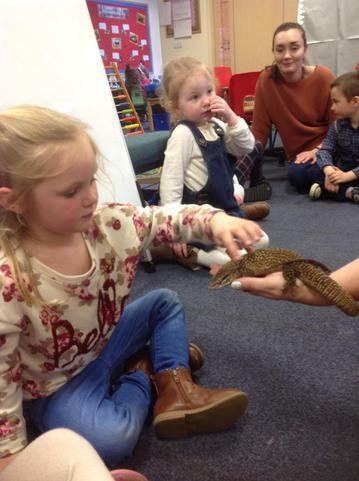 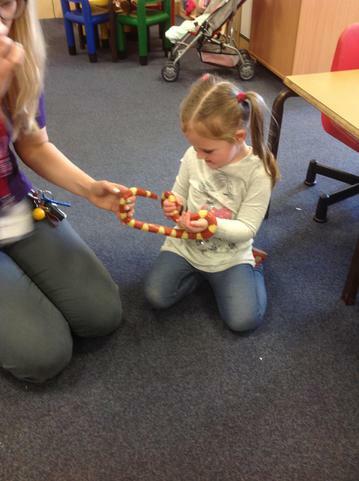 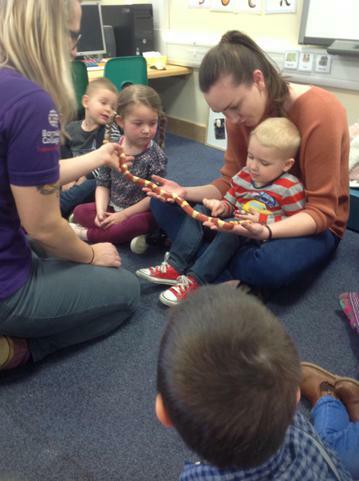 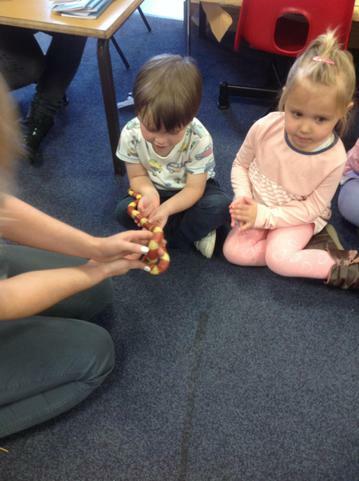 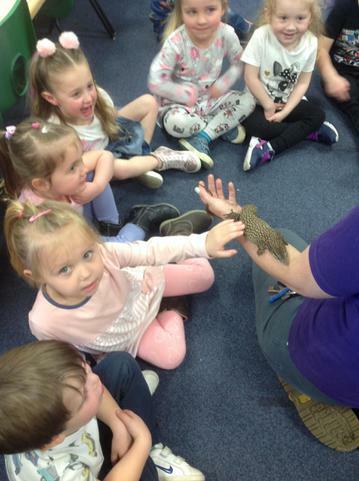 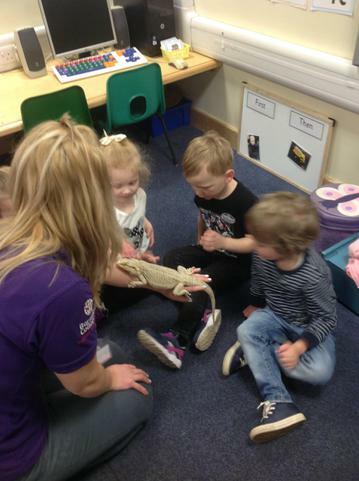 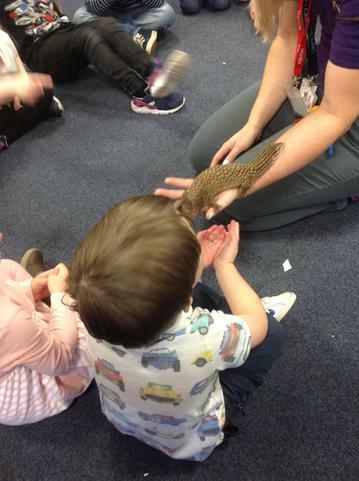 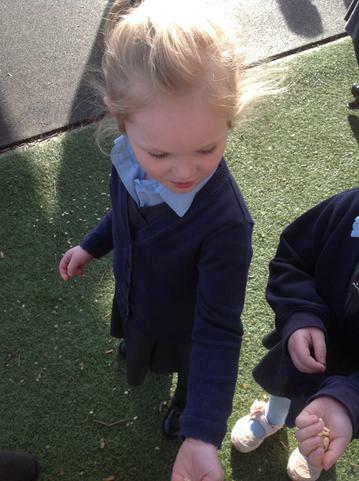 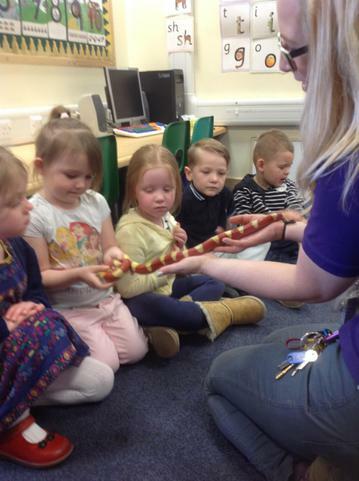 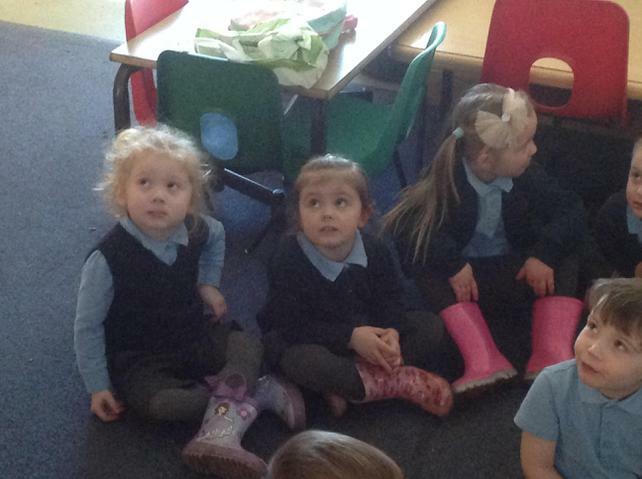 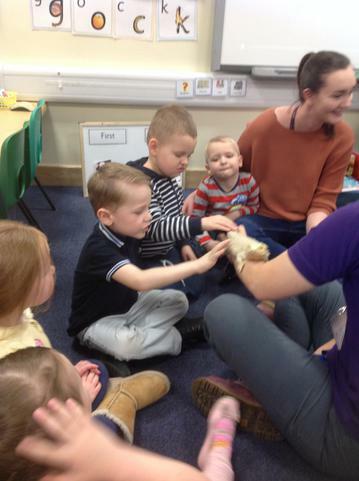 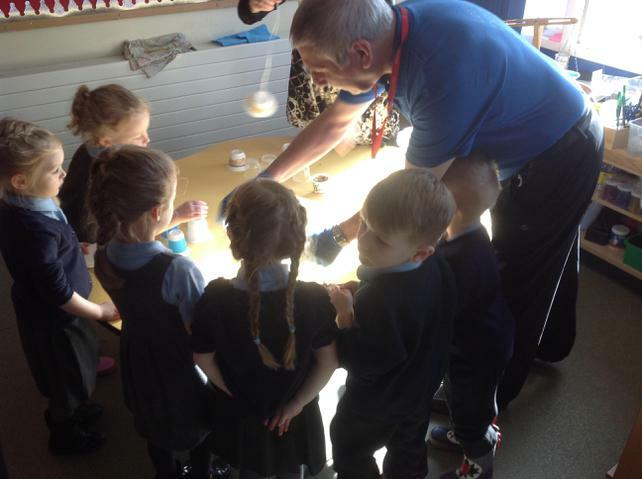 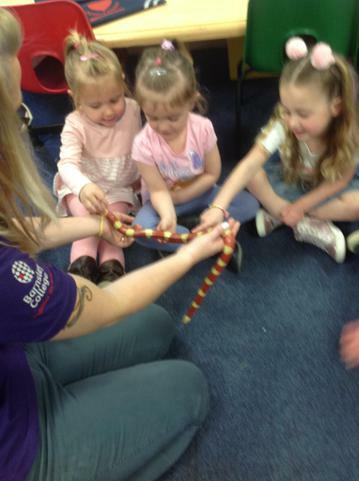 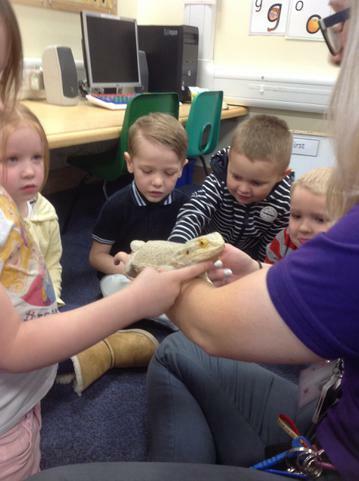 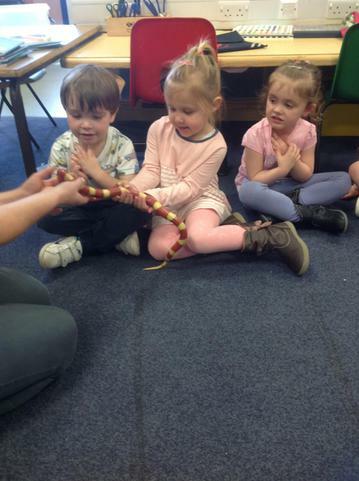 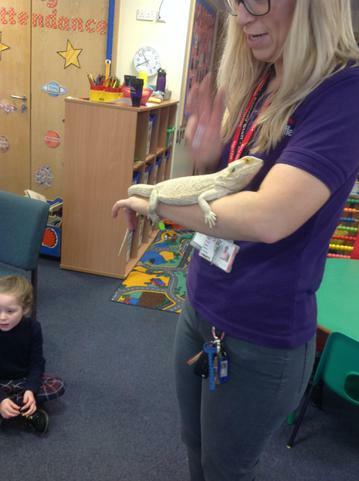 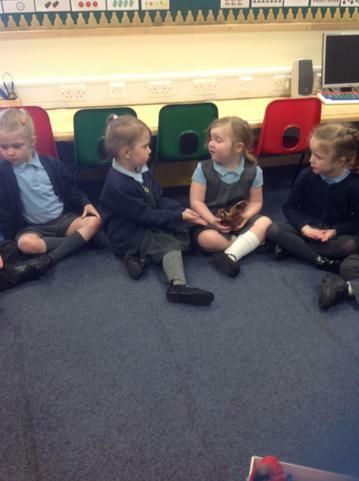 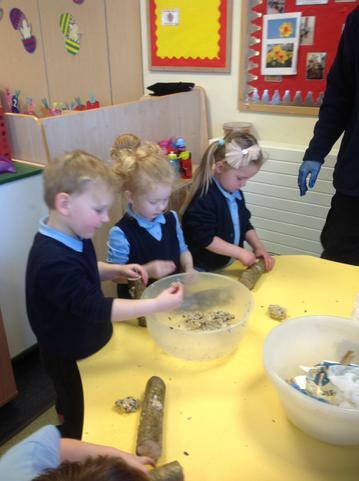 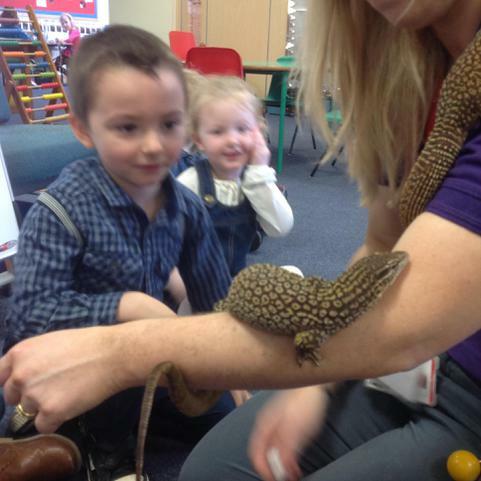 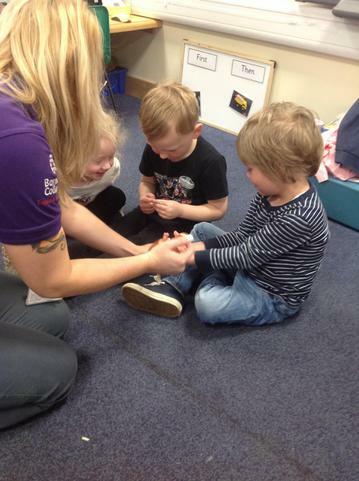 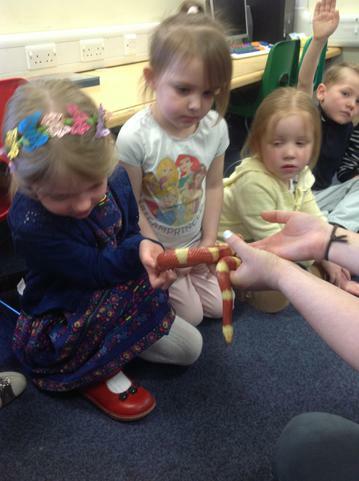 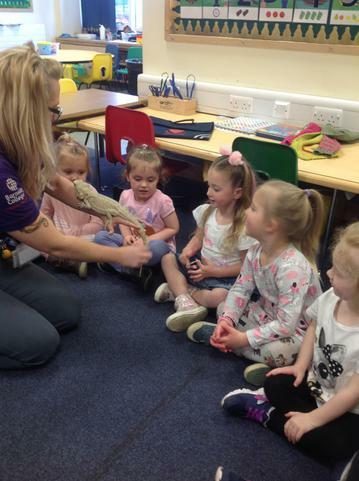 This week nursery was visited by some reptiles as part of our topic "Are Eggs Alive?". 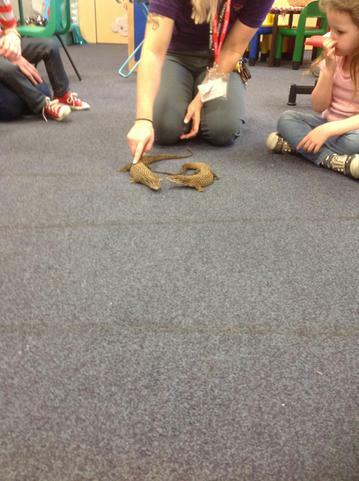 We had the chance to stroke a Bearded Dragon, a Nelson Milk Snake and two Monitor lizards! 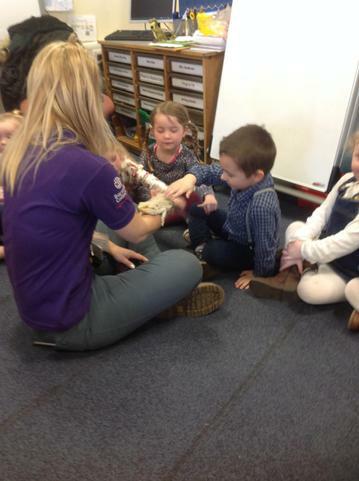 We were all fantastic with the animals, making sure we stroked them carefully and keeping quiet so that we did not scare them. 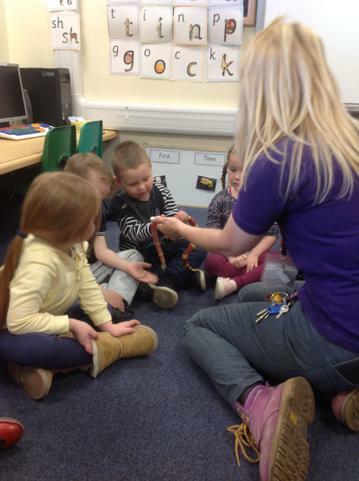 A lot of us even held the snake! 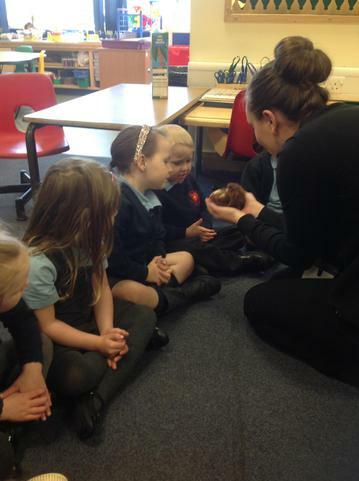 We asked lots of questions about the animals, such as 'what do they eat? 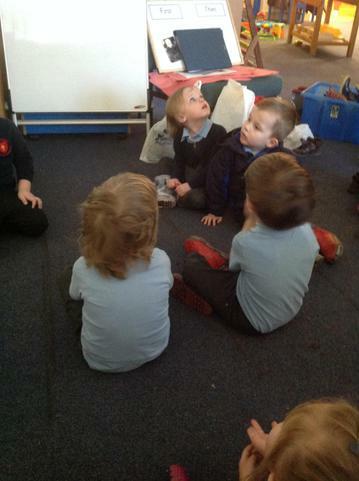 ', 'where do they sleep' and 'how does it move?'. 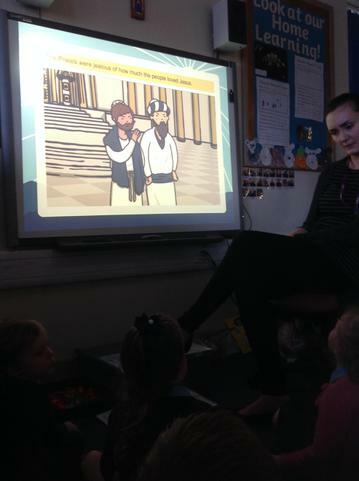 This visit really brought our topic to life! 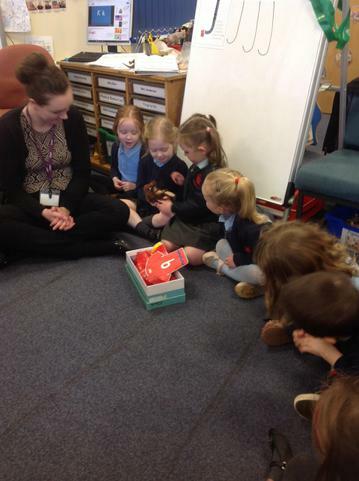 Week 4 - The Eggs have Hatched! 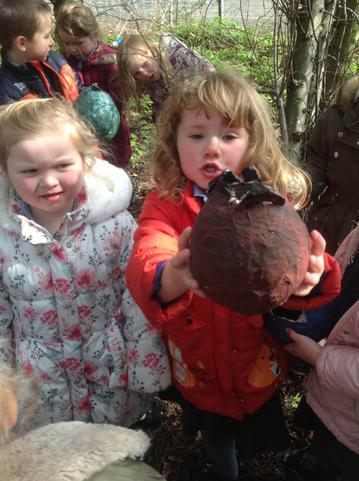 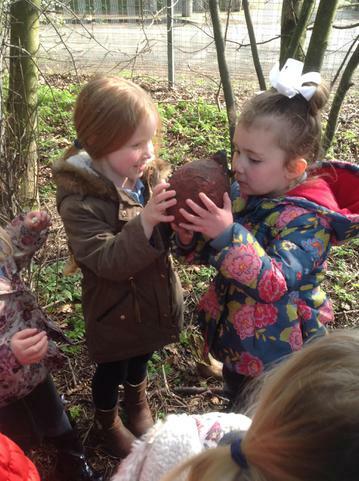 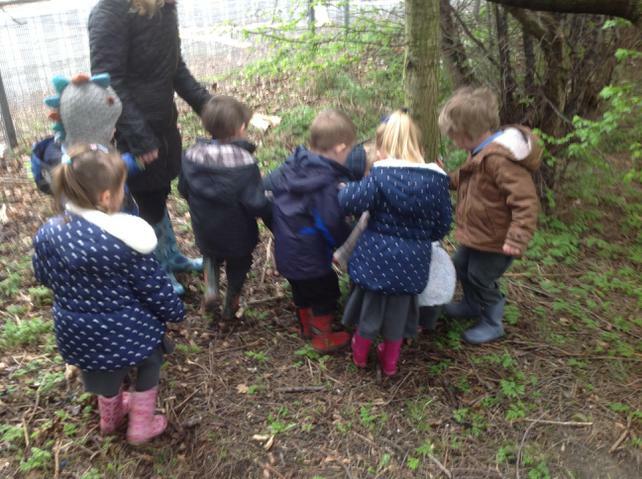 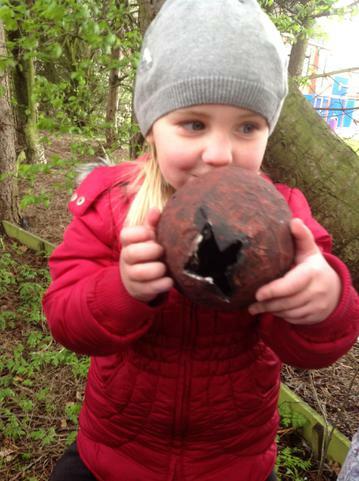 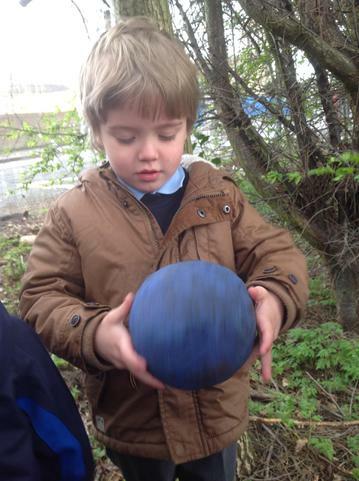 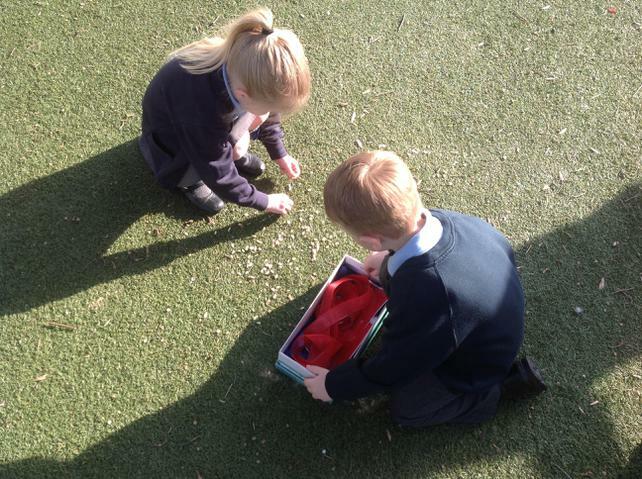 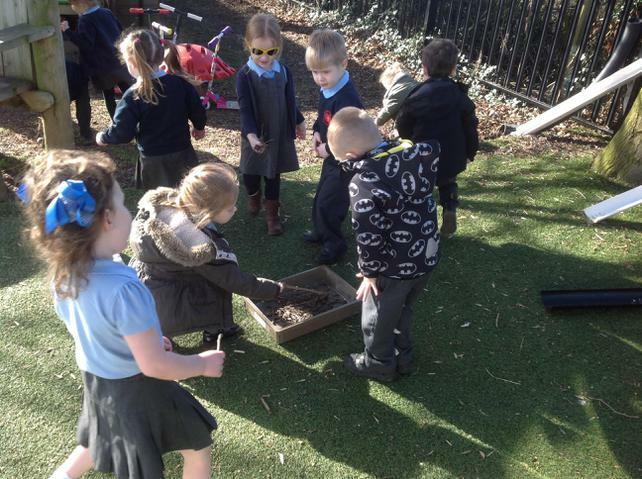 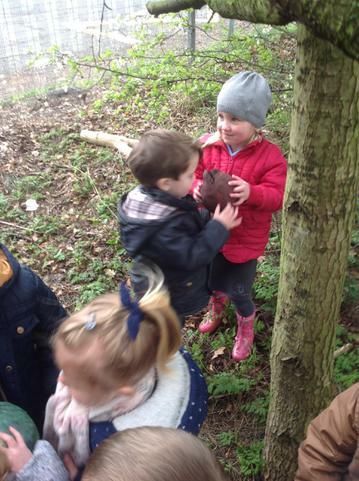 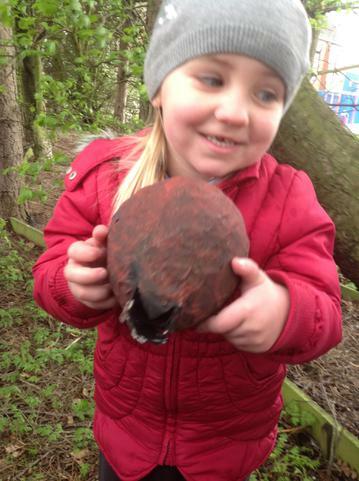 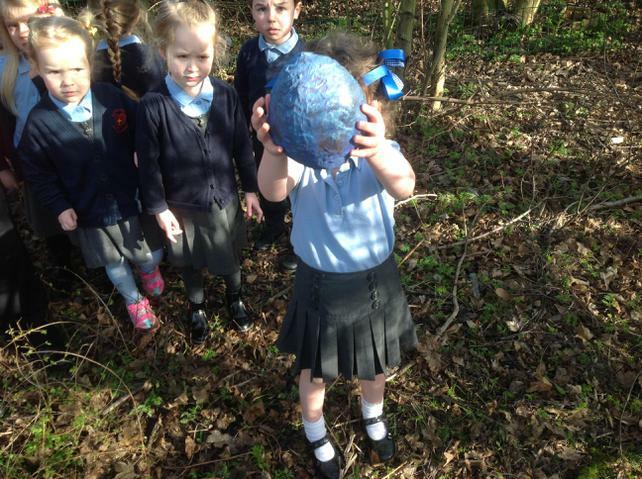 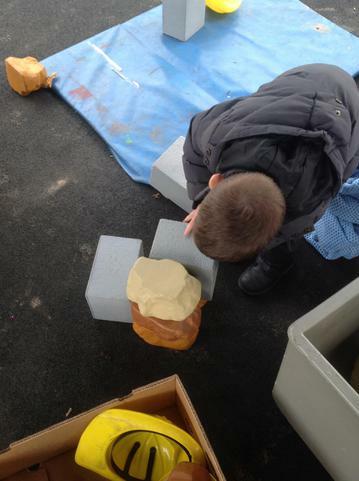 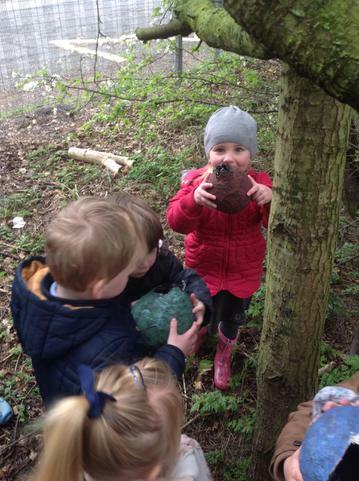 This week we went back outside to check on the dinosaur eggs. 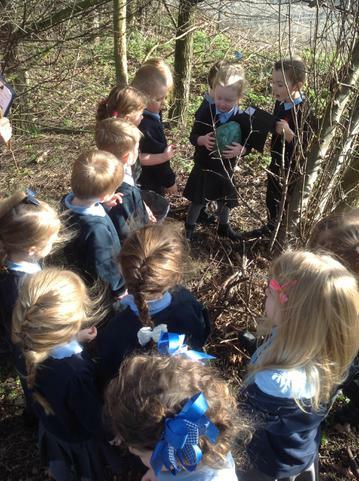 To our surprise we discovered the eggs had hatched! 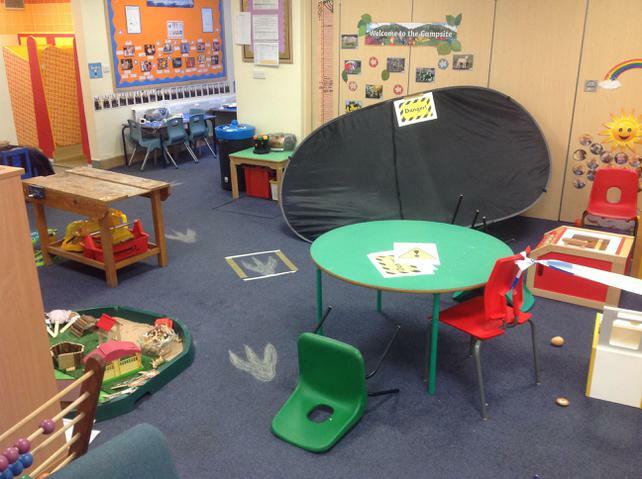 There were no dinosaurs in sight so we think they went to find new homes in dinosaur land. 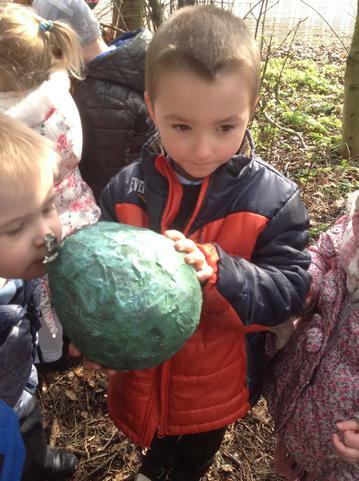 We talked about how the dinosaurs got out of the eggs and we think they used their claws and noses to tap their way out of the eggs. 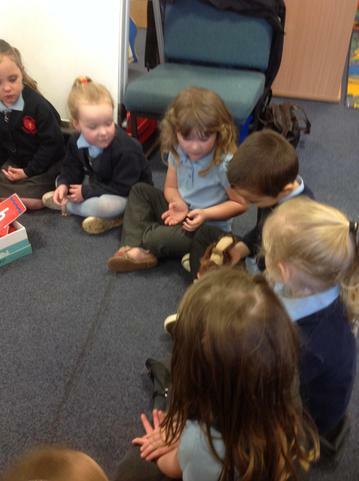 We we have been very engaged in this topic and our research projects have been fantastic to see. 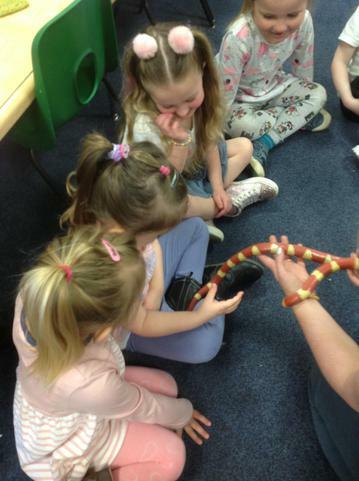 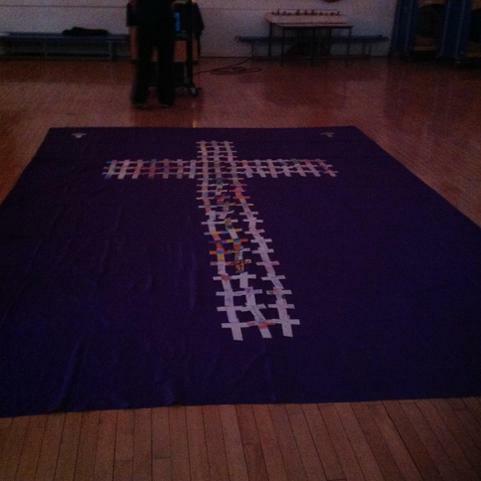 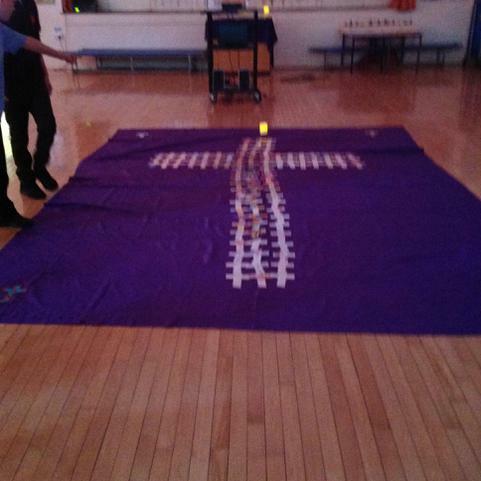 The children have really enjoyed to excitement and mystery of this topic! 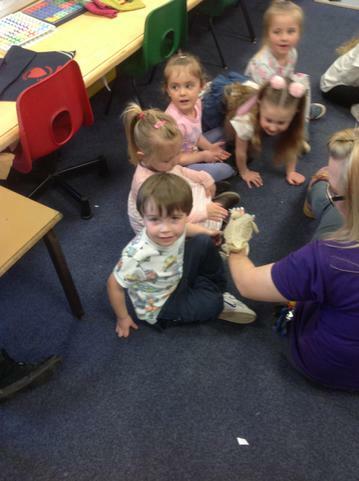 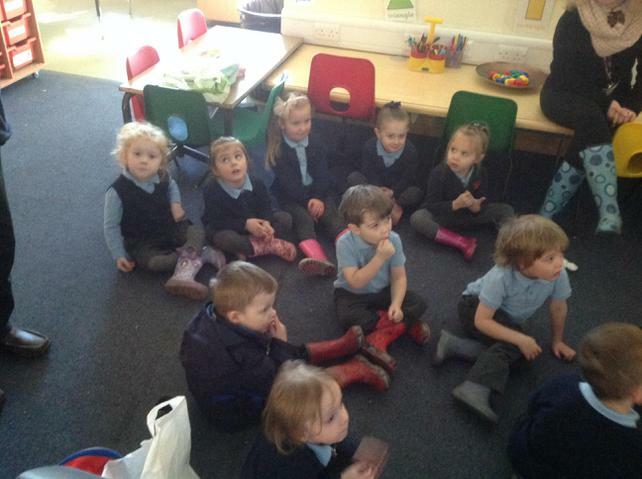 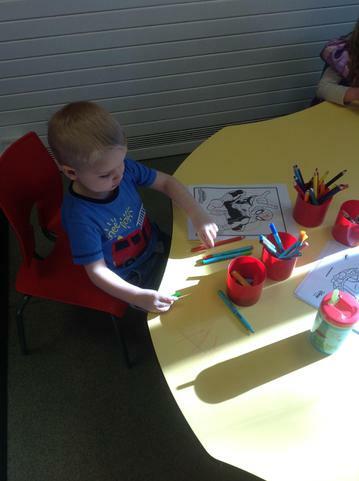 Week 3 - Dinosaurs in Nursery! 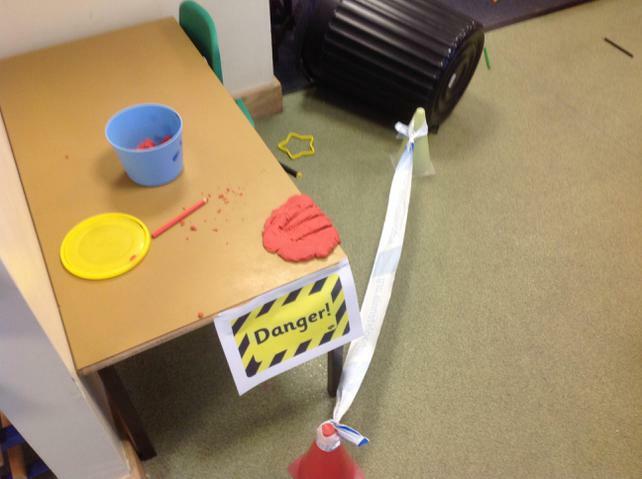 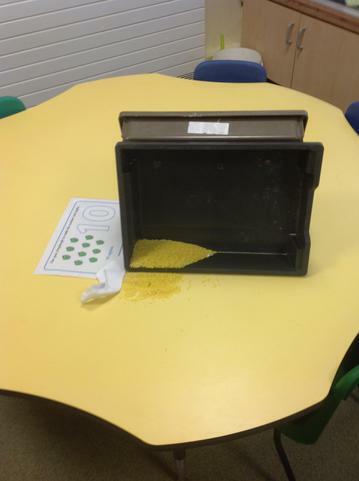 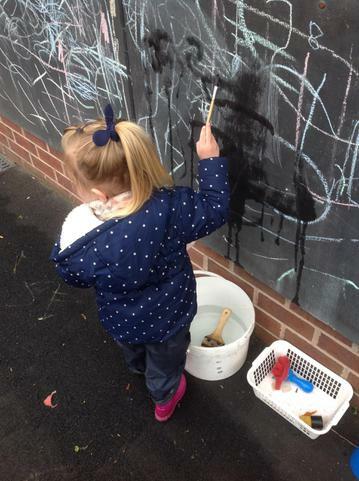 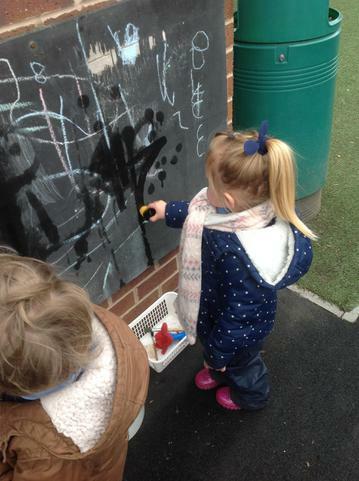 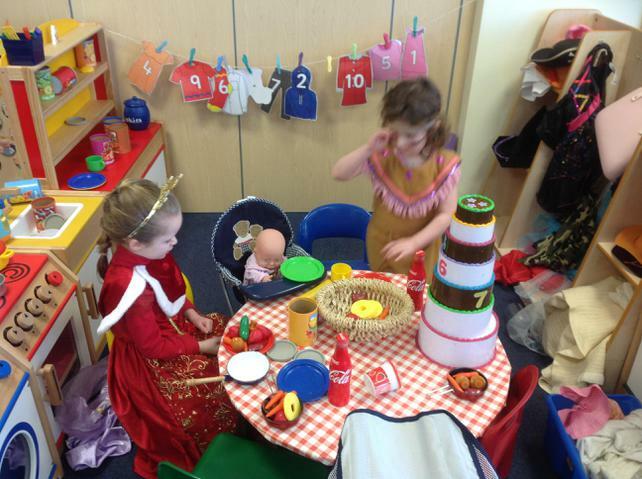 This week we came into nursery and found it had been destroyed! 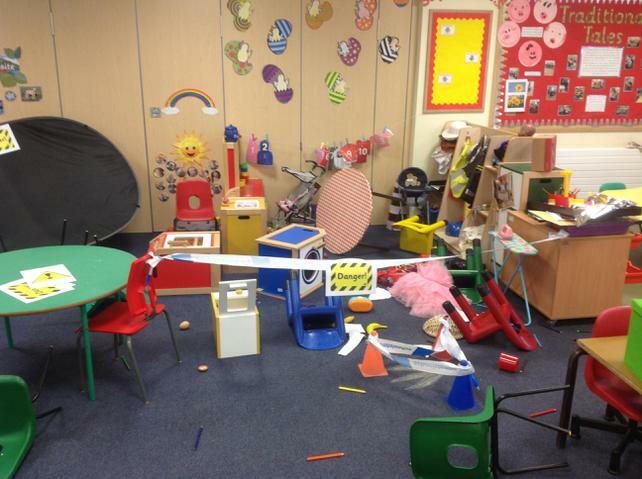 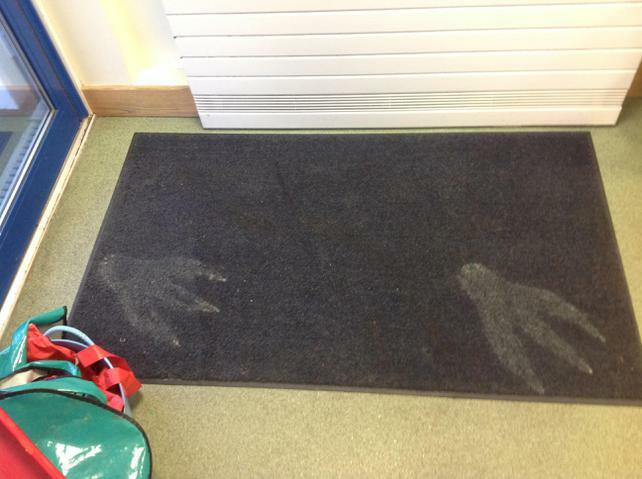 Someone or something had been into our nursery! 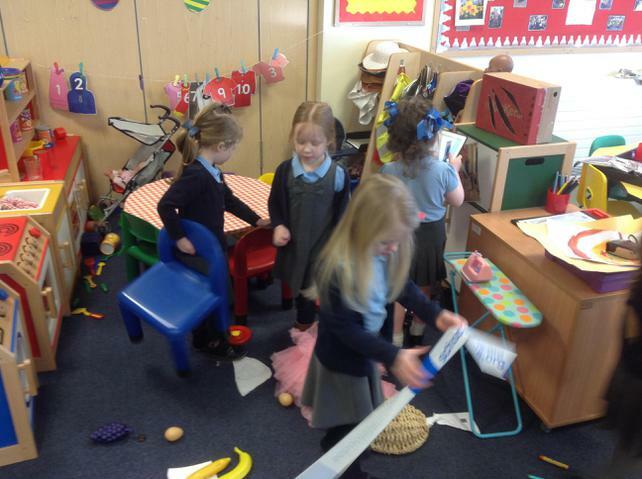 We had to become investigators for the day and gathers clues and evidence to prove that we didn't make the mess. 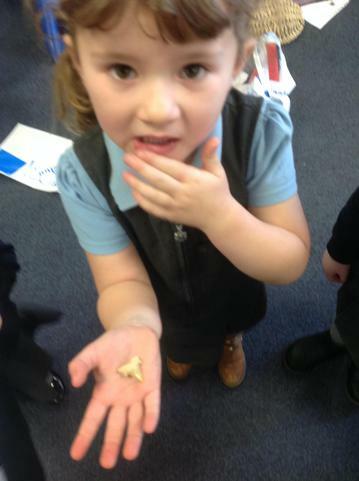 We found fossils, claw marks, footprints and even a tooth! 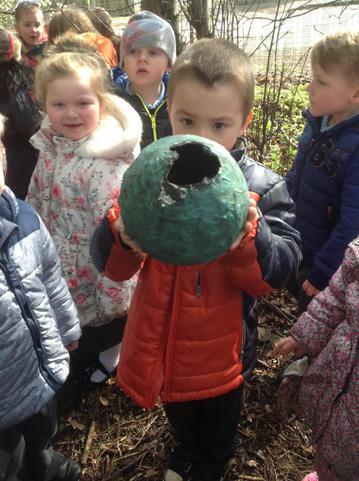 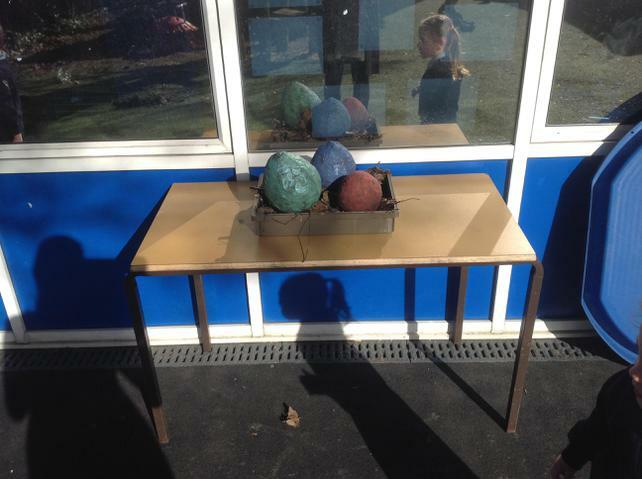 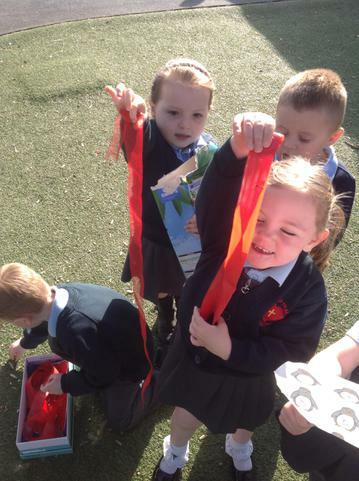 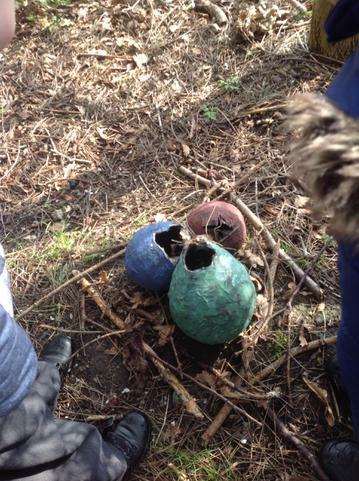 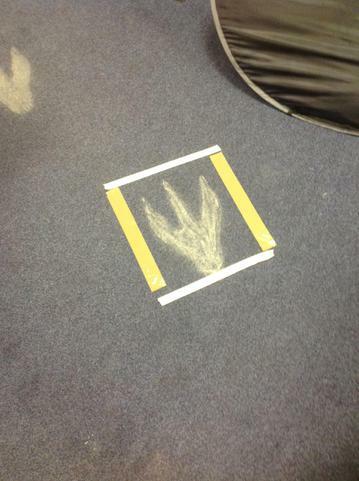 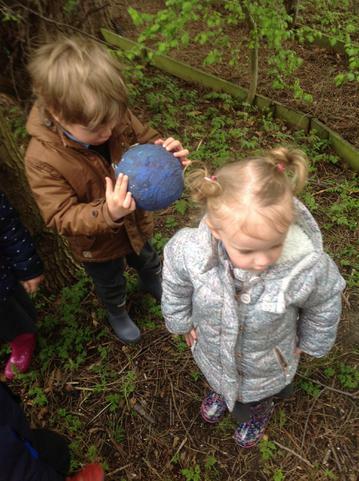 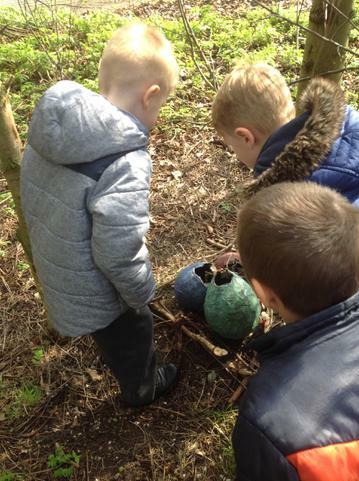 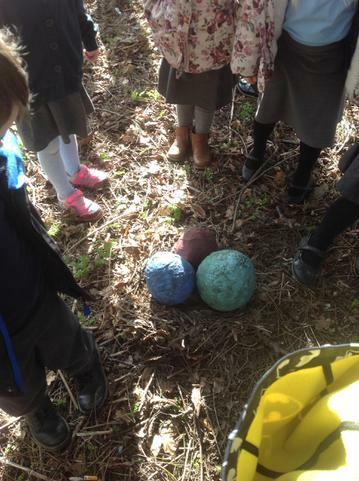 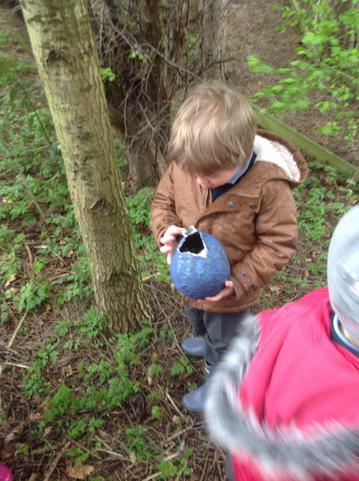 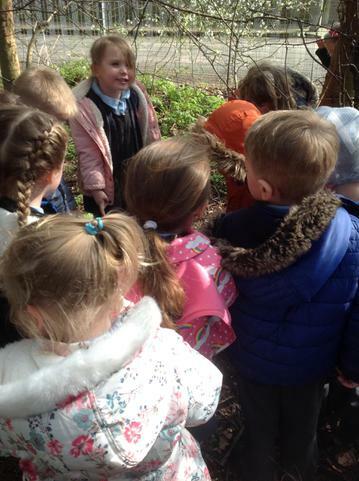 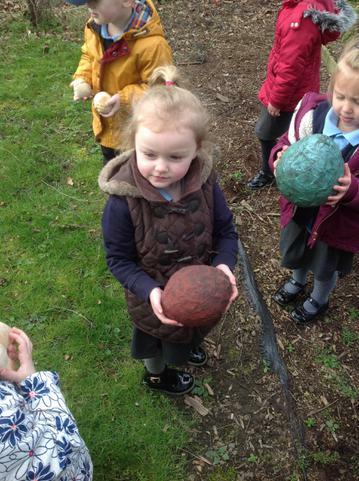 We followed the footprints outside and found three dinosaur eggs outside! 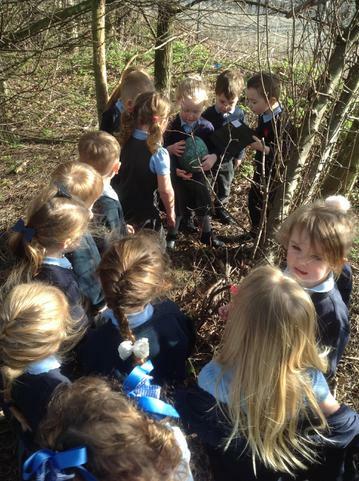 We had to make a nest for the eggs and leave them where we found them. 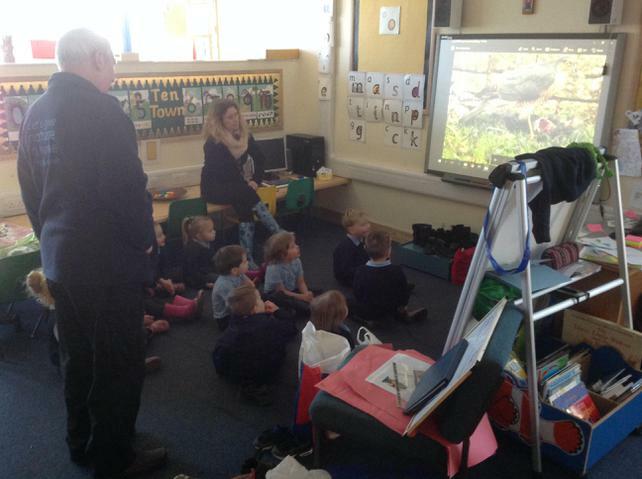 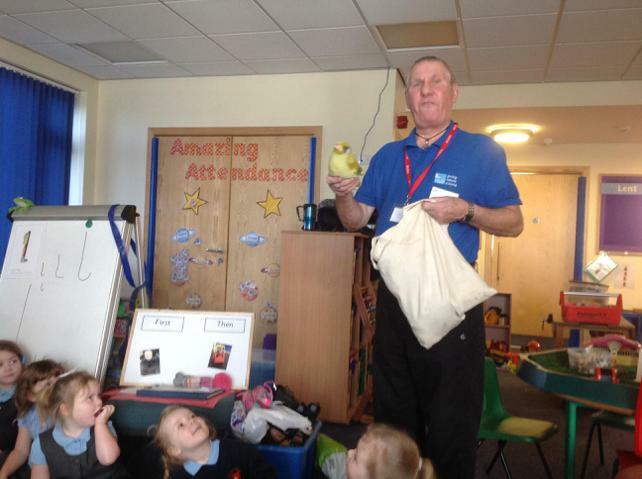 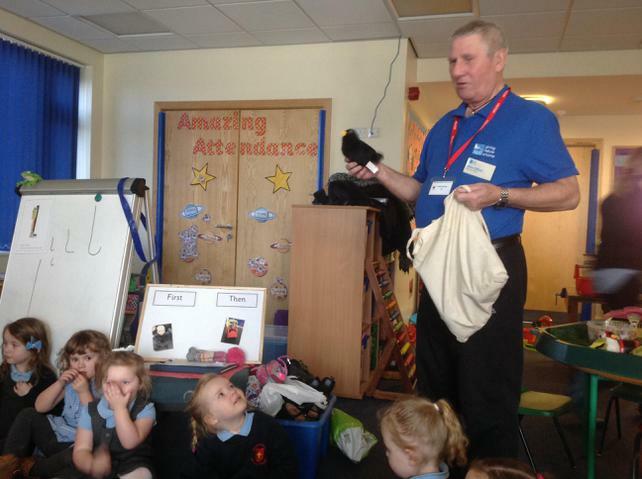 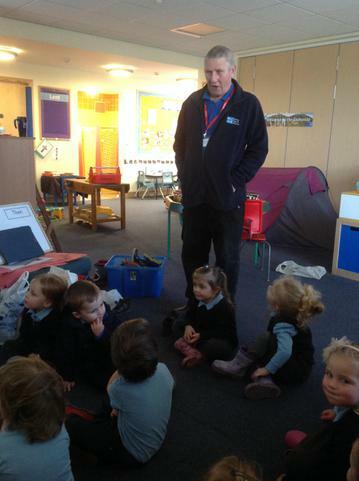 This week we had a visitor from the RSPB center to talk to us about different birds. 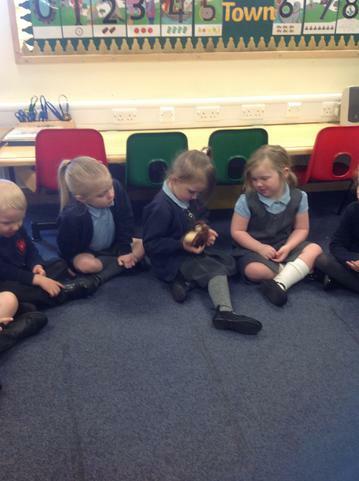 We learnt about birds of prey and that different birds have different songs. 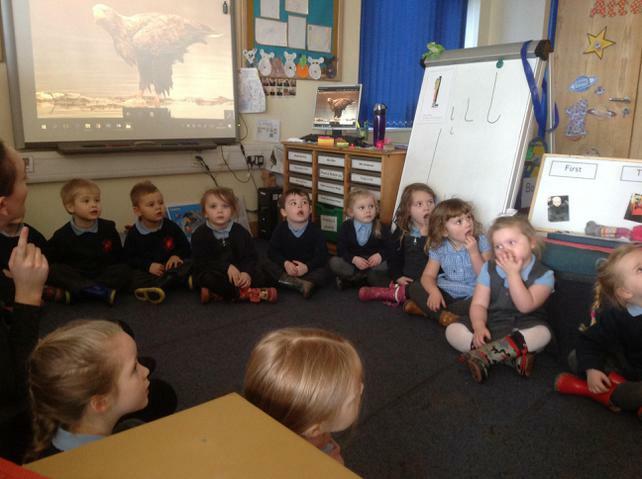 We had to listen carefully to the different bird songs. 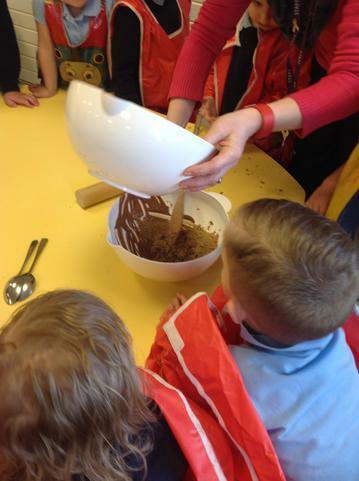 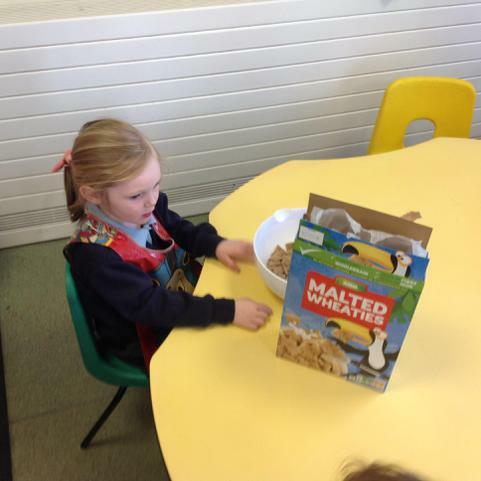 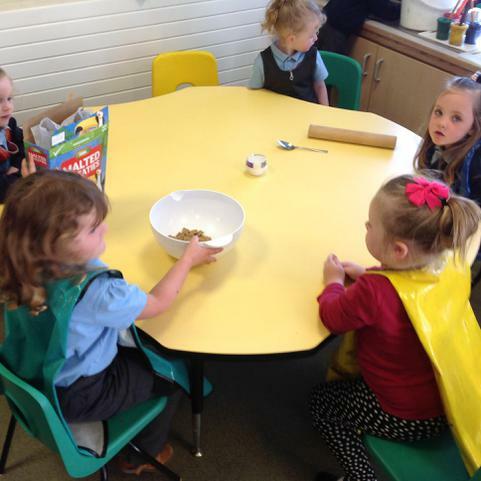 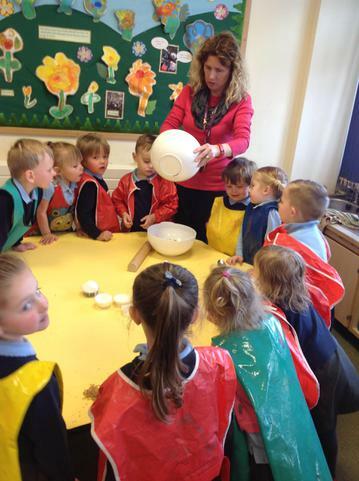 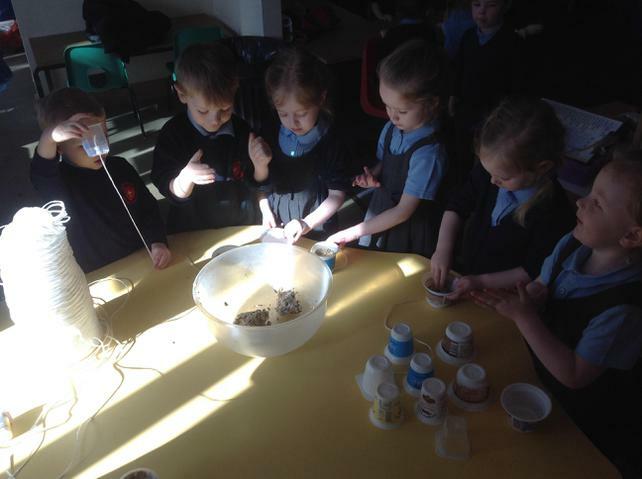 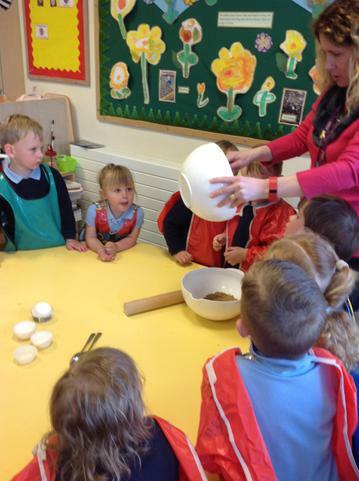 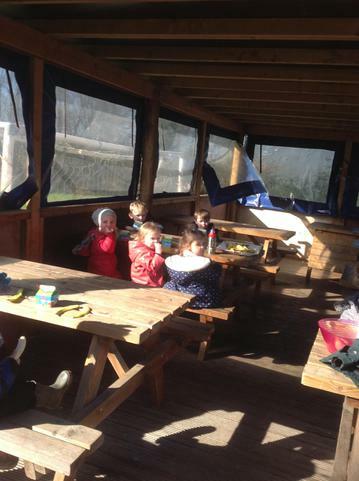 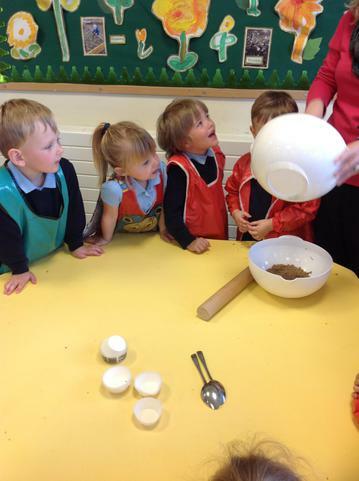 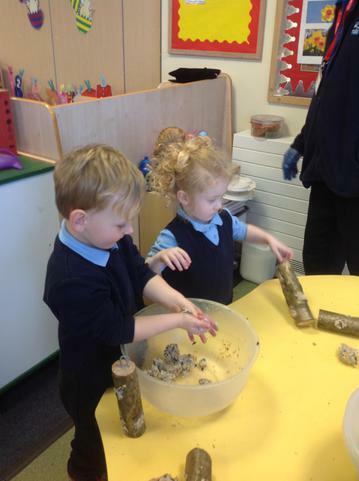 We then talked about what birds eat and made some bird feeders out of yogurt pots, lard and seeds. 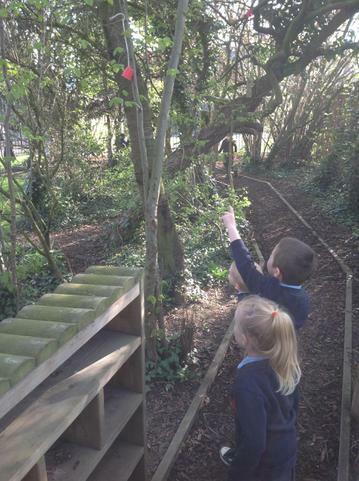 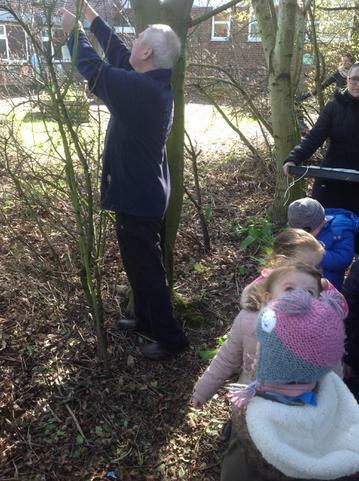 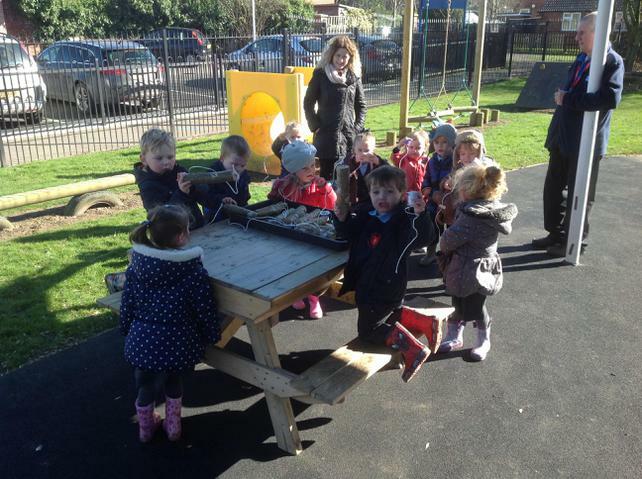 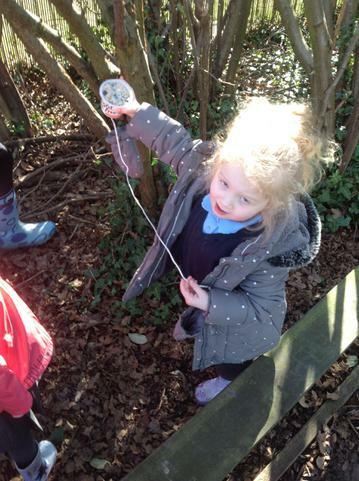 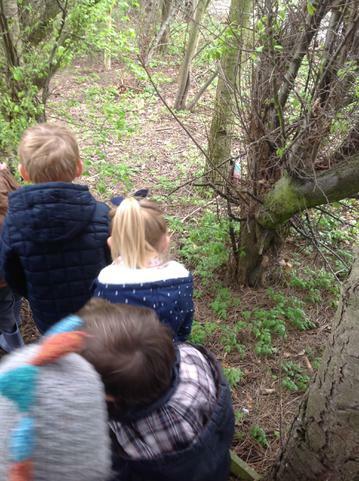 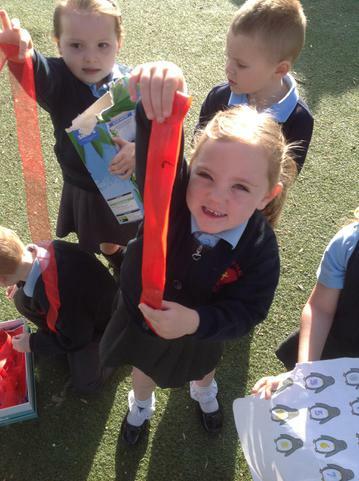 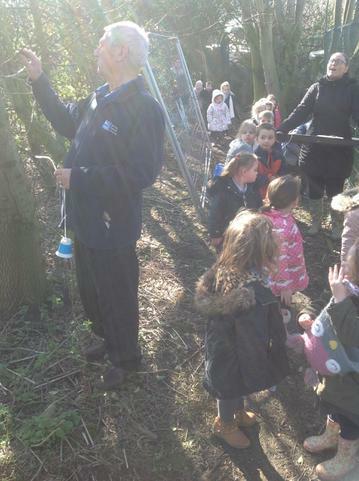 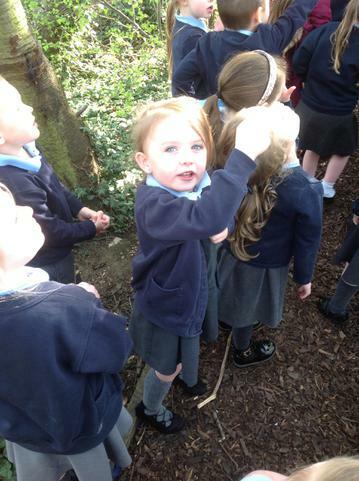 We then went into our outdoor area and hung the bird feeders all around school. 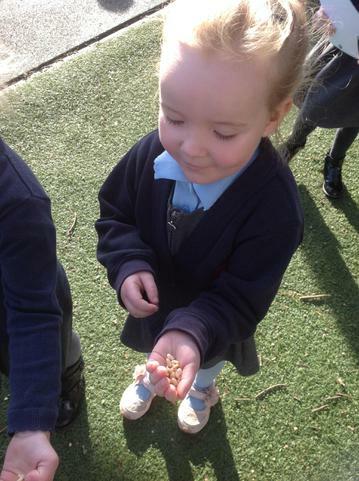 We will be going out to see whether the birds have been eating the bird feed! 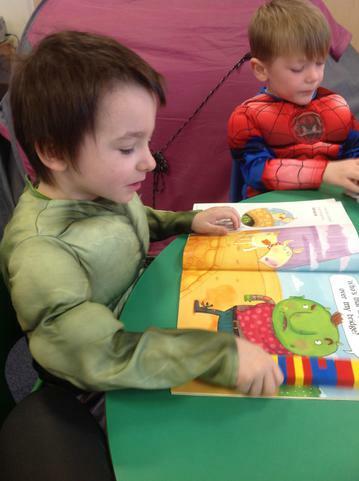 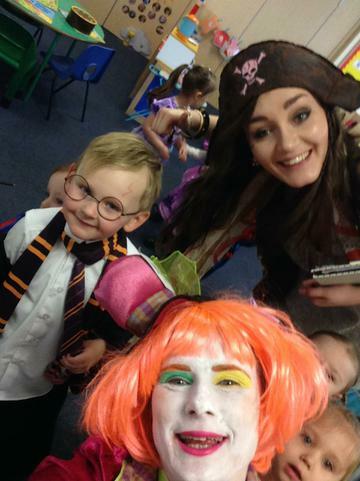 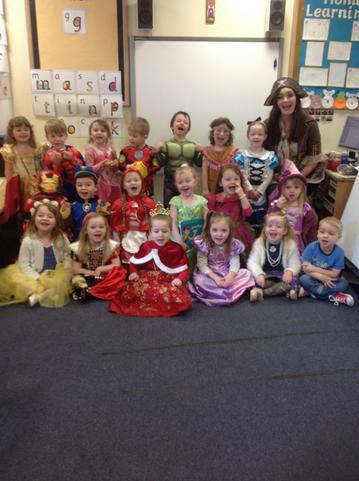 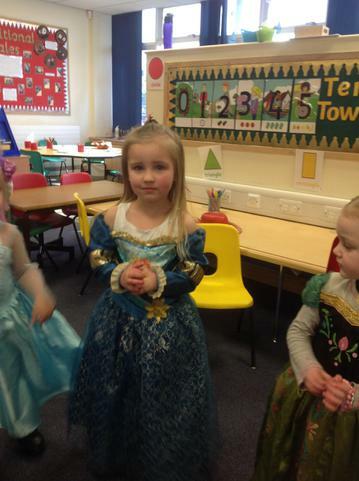 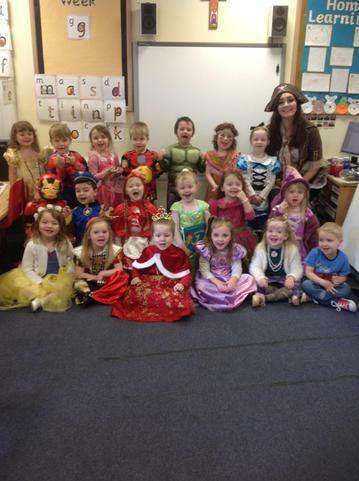 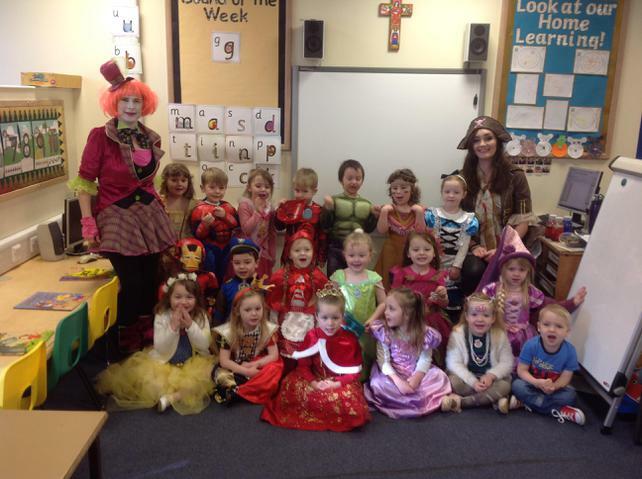 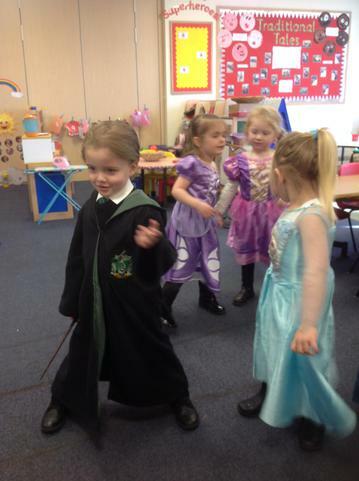 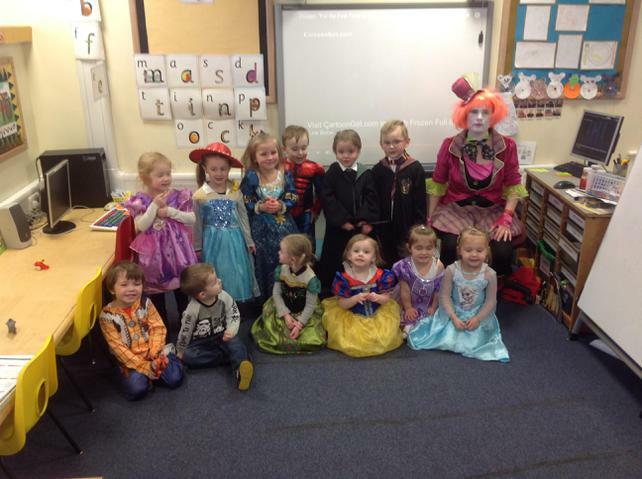 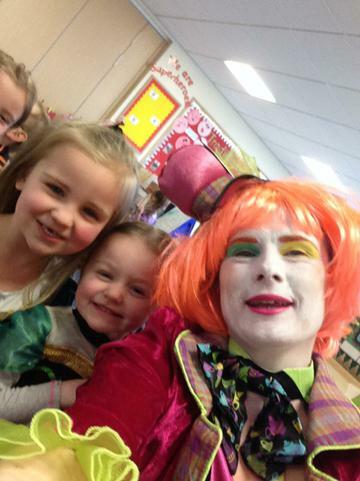 On a Thursday we celebrated world book day. 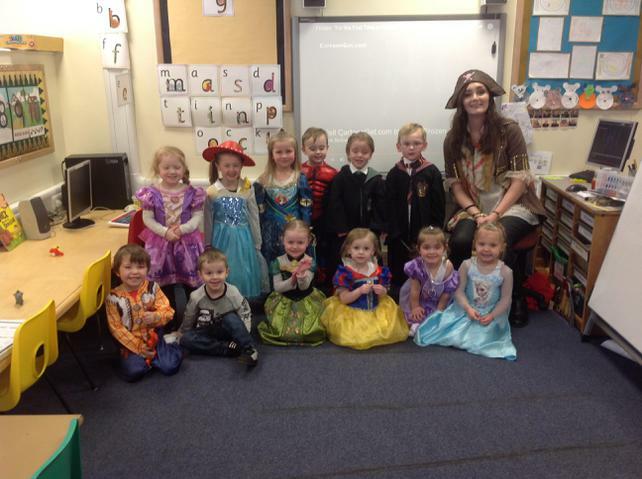 We came dressed up as lots of different characters. 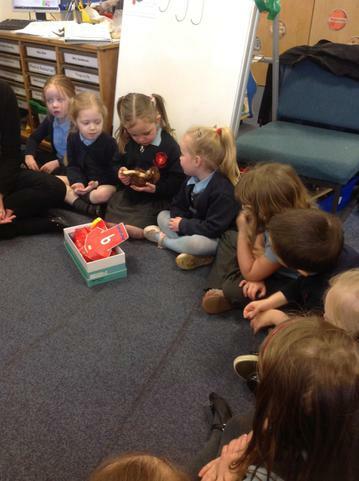 Some of us brought in our favourite books and showed them to the class. 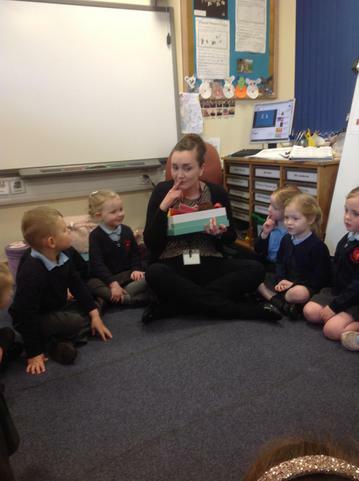 We had lots of our traditional tales out to promote a love for books. 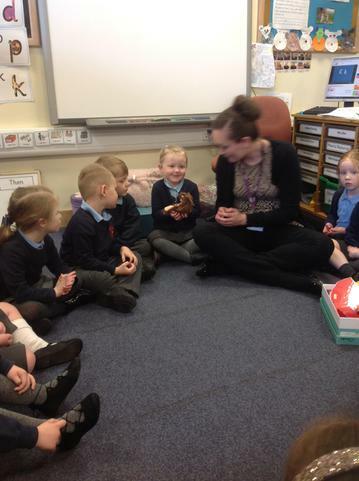 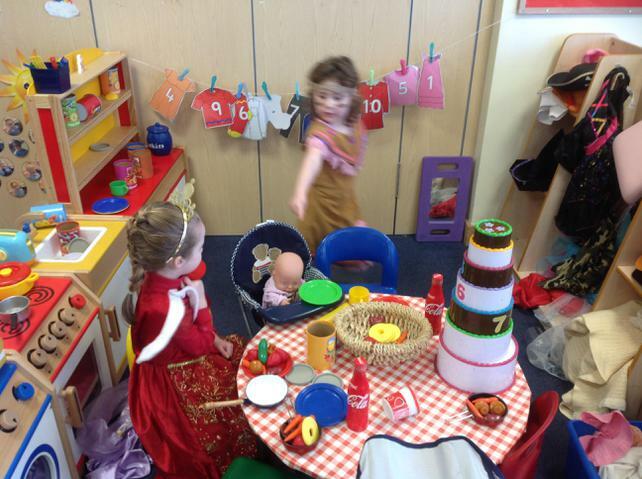 We read Owl Babies from our story sack and had the chance to explore some of our other story sacks including 'The Gruffalo' and 'The Hungry Caterpillar'.